For a correct dimensioning of a vacuum cup handler, it is important to know and assess the features of the load to be handled. For this reason, please fill in the following form and send it back to us via fax or e-mail. This way, we will be able to suggest you the best cups to solve your problem. A drawing of the product to be handled or the product itself would allow us to offer the best solution. 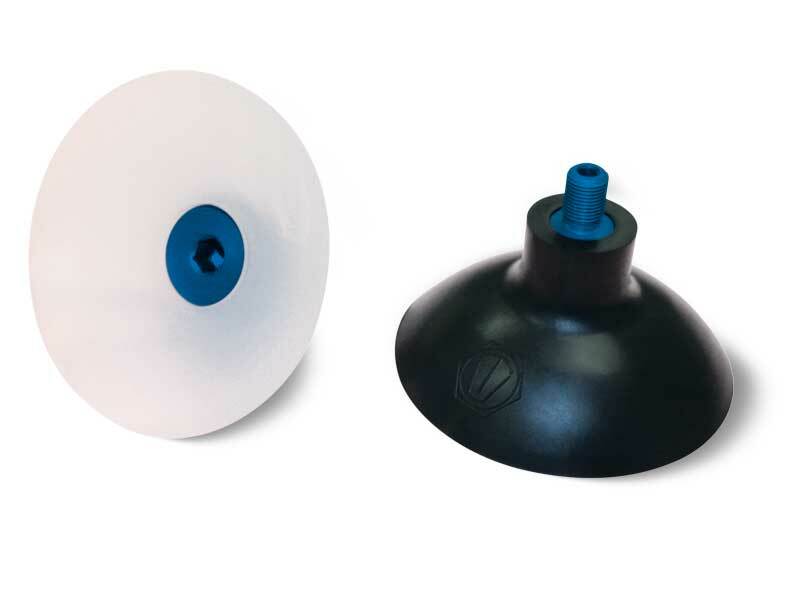 These traditional cup-shaped vacuum cups are suited for gripping and handling small objects with flat, slightly concave or convex surfaces. 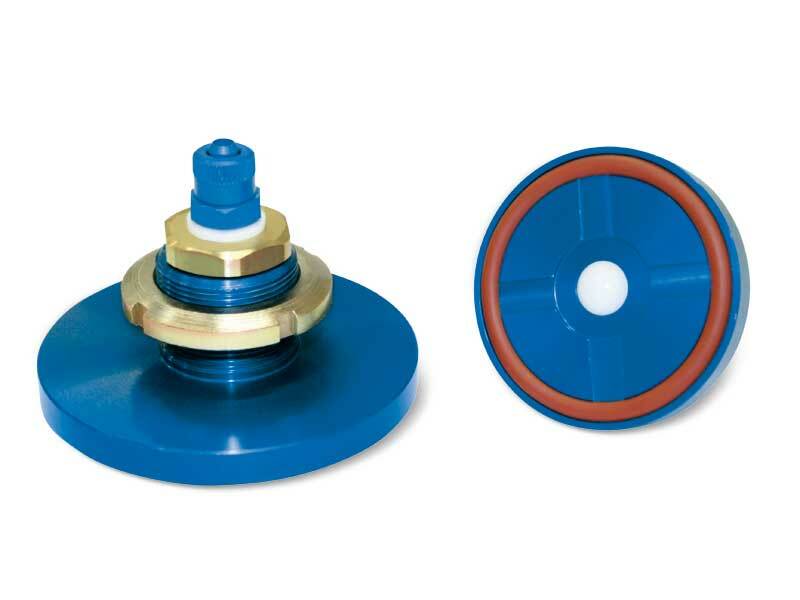 This series of widely used cups have diameters ranging from 4 to 9 mm and are normally available in standard compounds: natural para rubber N, oil-resistant rubber A and silicon S. They can be cold-assembled with no adhesive onto a nickelplated brass support. The support has been specially shaped to perfectly fit with the cup and it is equipped with a male threaded pin to optimise the fastening to the machine. These cups are extremely easy to replace; for the spare part, in fact, all you have to do is request the cup indicated in the table in the desired compound. 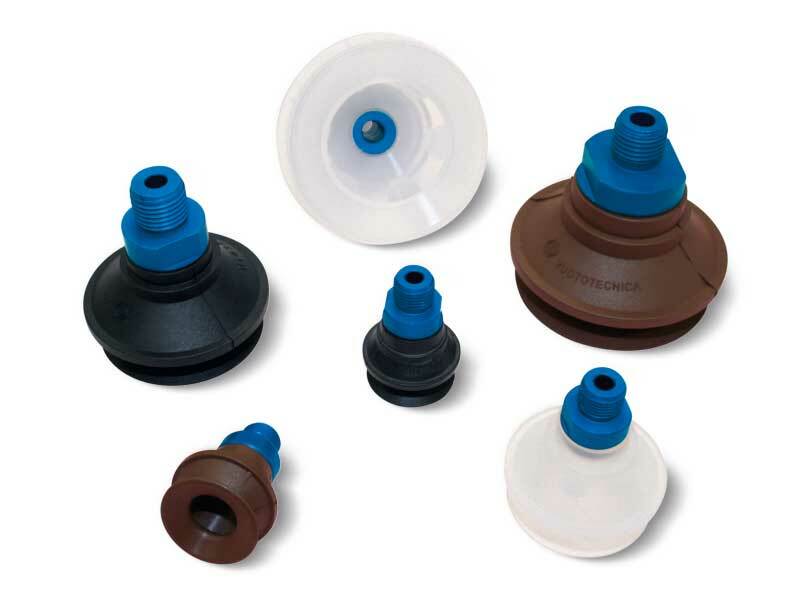 Cups in special compounds shown on top and supports in different materials can be provided upon request in minimum quantities to be defined in the order. 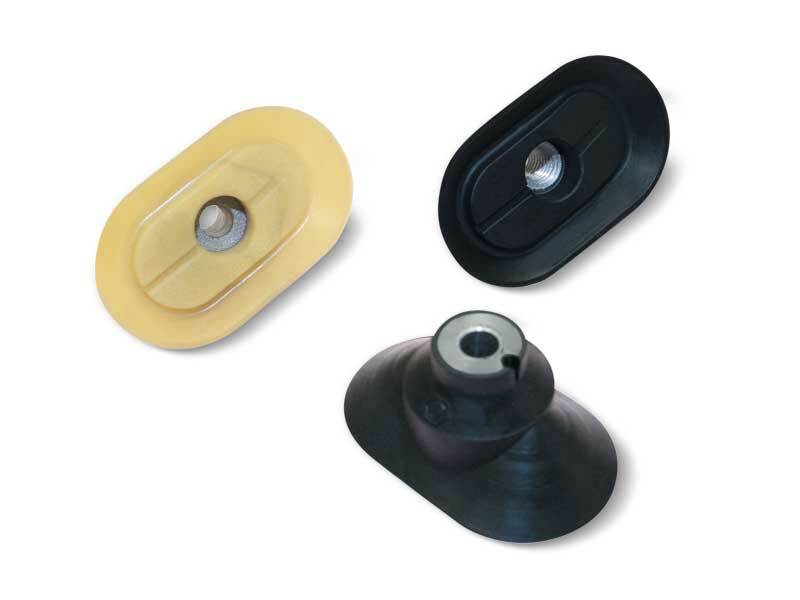 These traditional cup-shaped vacuum cups are suited for gripping and handling small objects with flat, slightly concave or convex surfaces. 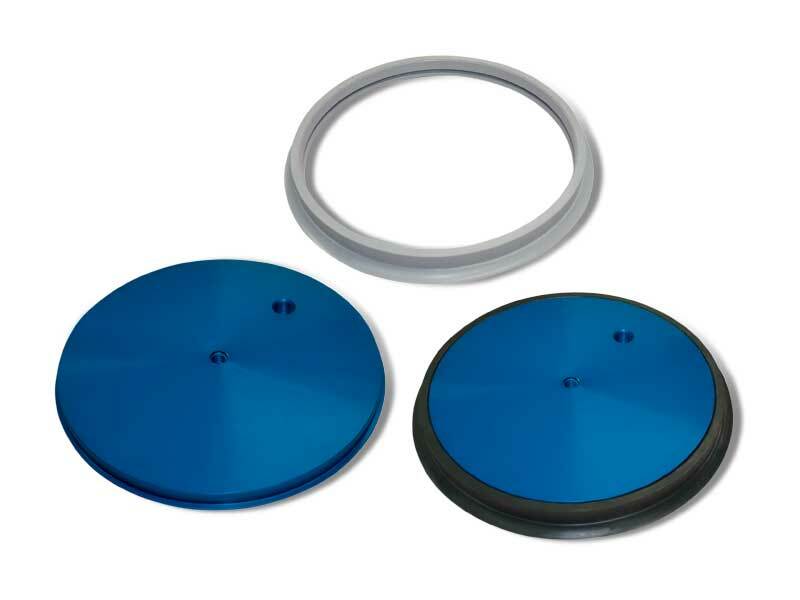 This series of widely used cups have diameters ranging from 10 to 45 mm and are normally available in standard compounds: natural para rubber N, oil-resistant rubber A and silicon S. They can be cold-assembled with no adhesive onto a nickel-plated brass or anodised aluminium support. The support has been specially shaped to perfectly fit with the cup and it is equipped with a male threaded pin to optimise the fastening to the machine. These cups are extremely easy to replace; for the spare part, in fact, all you have to do is request the cup indicated in the table in the desired compound. Cups in special compounds indicated at page 21 and supports in different materials can be provided upon request in minimum quantities to be defined in the order. 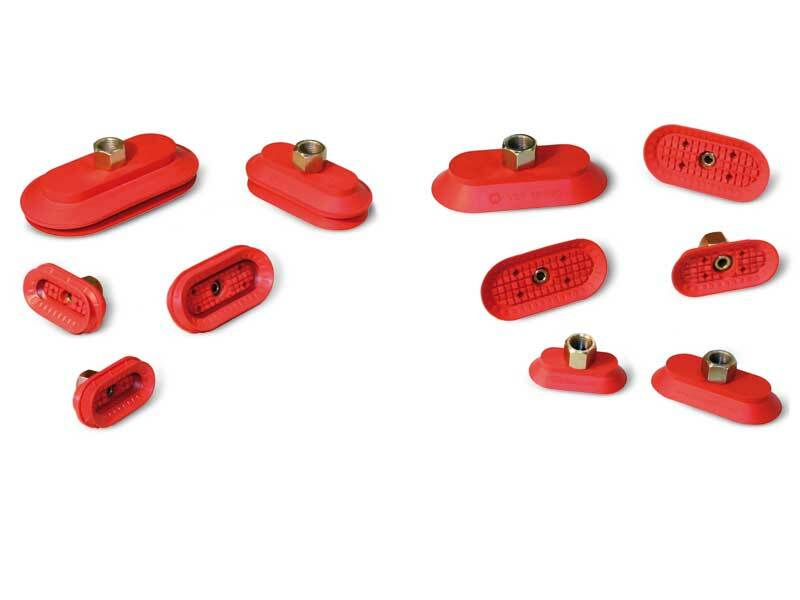 These traditional cup-shaped vacuum cups are suited for gripping and handling small objects with flat, slightly concave or convex surfaces. 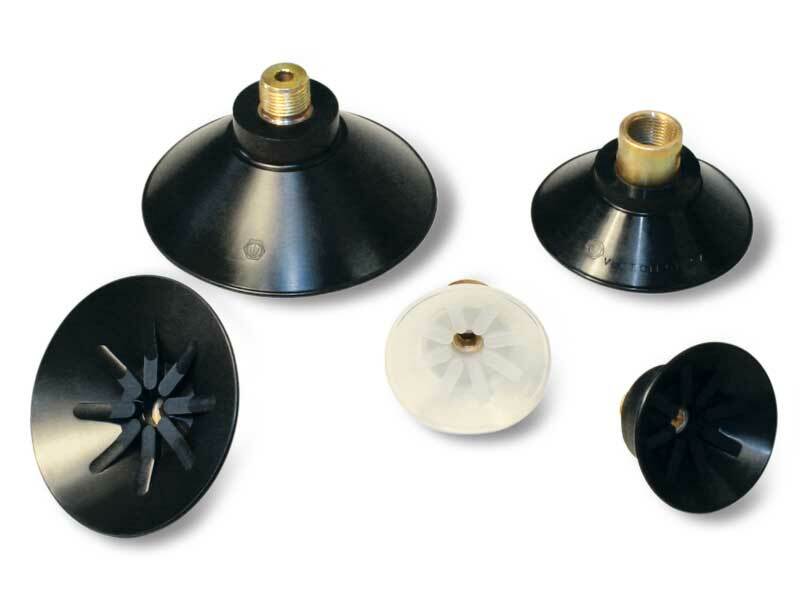 This series of widely used cups have diameters of 85 mm and are normally available in standard compounds: natural para rubber N, oil-resistant rubber A and silicon S. They can be cold-assembled with no adhesive onto an anodised aluminium support. The support has been specially shaped to perfectly fit with the cup and it is equipped with a male threaded pin to optimise the fastening to the machine. 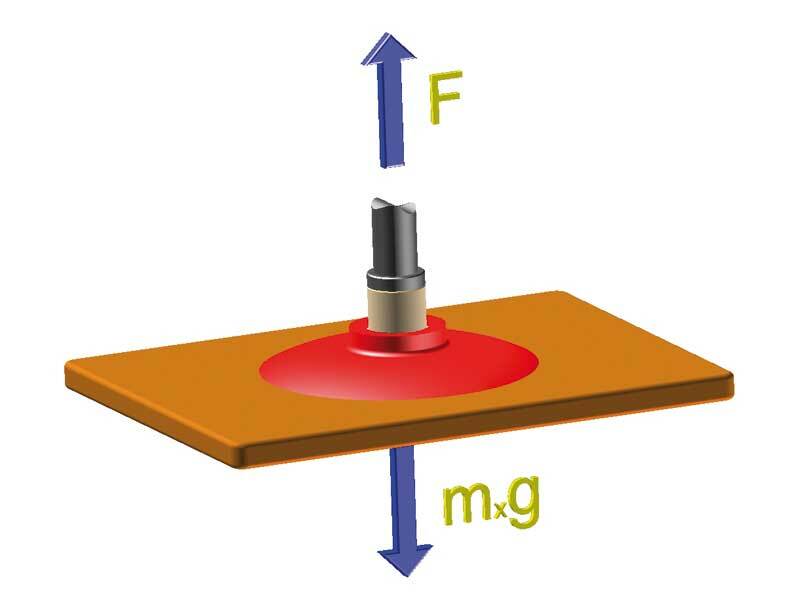 Moreover, those with 1/4” thread have an M8 threaded hole, to allow the possible insertion of a calibrated grub screw (see page 1.118) to reduce the amount of sucked air. These cups are extremely easy to replace; for the spare part, in fact, all you have to do is request the cup indicated in the table in the desired compound. Cups in special compounds shown on top and supports in different materials can be provided upon request in minimum quantities to be defined in the order. 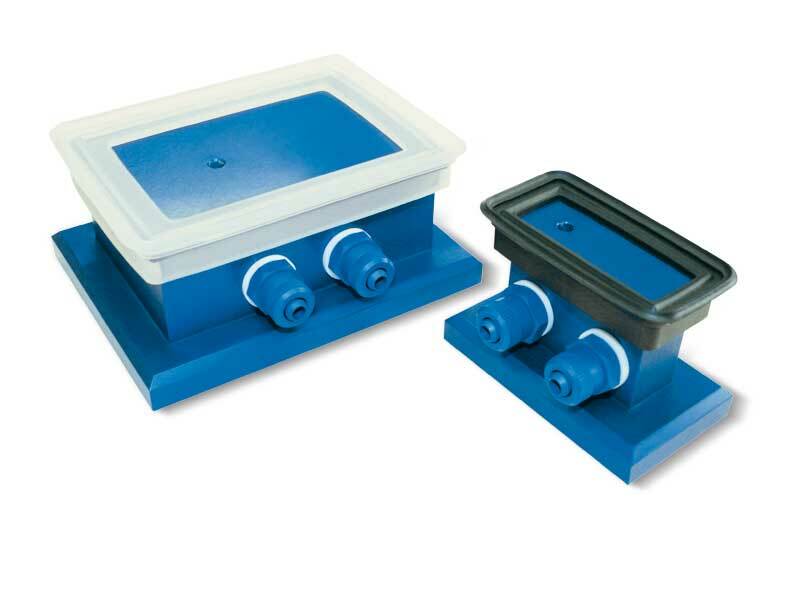 These sturdy and rather deep cups are designed to handle bodywork components in moulded sheet steel. These cups are produced with a special compound called BENZ, which can resist to heavy loads and to the chlorine usually contained in the oil used for moulding and drawing of the sheet steel. The galvanised steel support is vulcanised onto the cup. 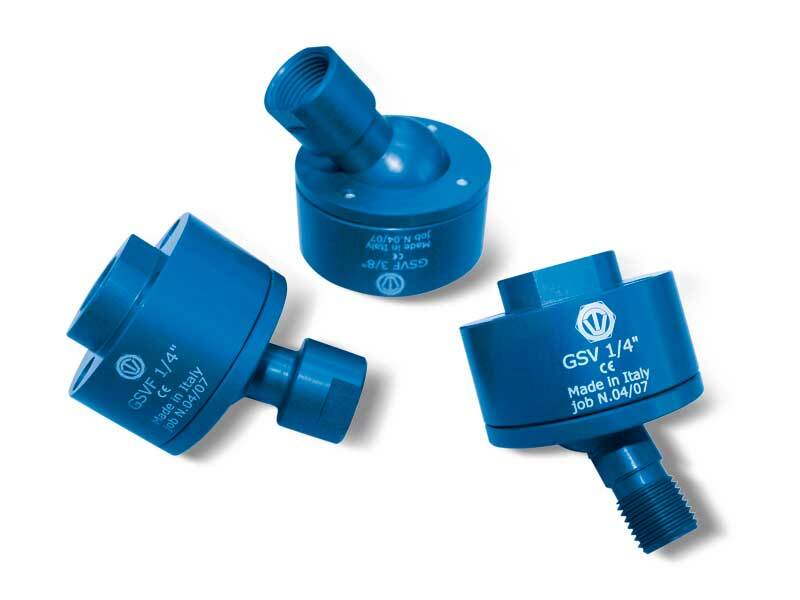 Galvanised steel adapters are also available to allow modifying the suction connection from M10 to gas or NPT threads. Cups in special compounds shown on top can be provided upon request in minimum quantities to be defined in the order. 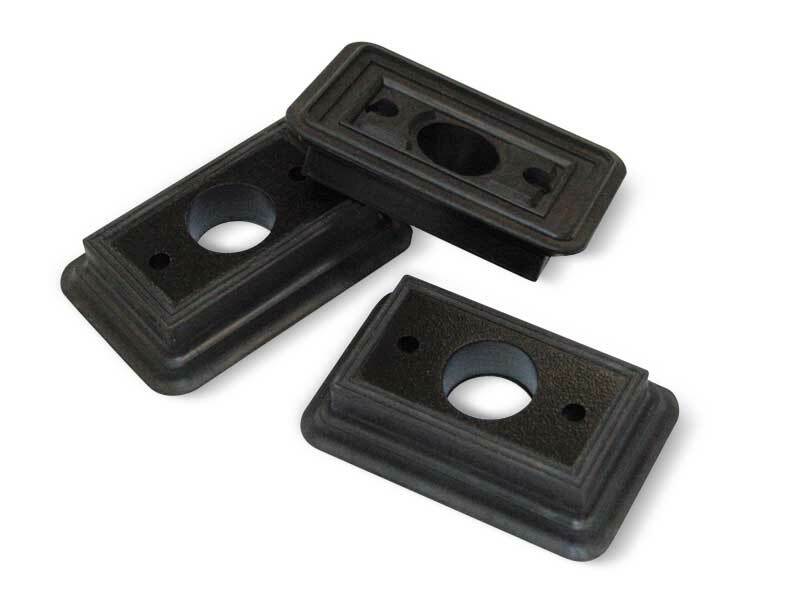 These cups are specially designed for gripping moulded or drawn sheet metal and are largely used in the automotive sector. Their ground lip allows an immediate gripping of the load to be lifted as soon as contact is made and ensures perfect vacuum seal. 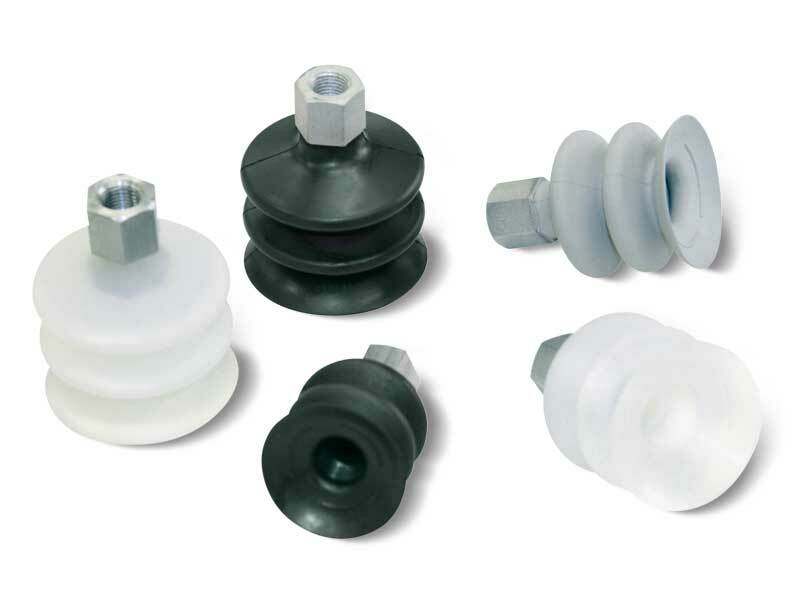 These cups are produced in a special compound called BENZ, able to withstand chlorine usually contained in the oils used for moulding and drawing the sheet metal. The galvanised steel support is vulcanised onto the cup. They are obviously available also in natural para rubber and silicon. These Vacuum cups are very similar to those described in the previous page, they differ only for their round lip and their internal cleats. These features allow them to be used even in the heaviest conditions. The field of use is the same. They are also made with BENZ compound and the galvanised steel support is vulcanised onto the cup. 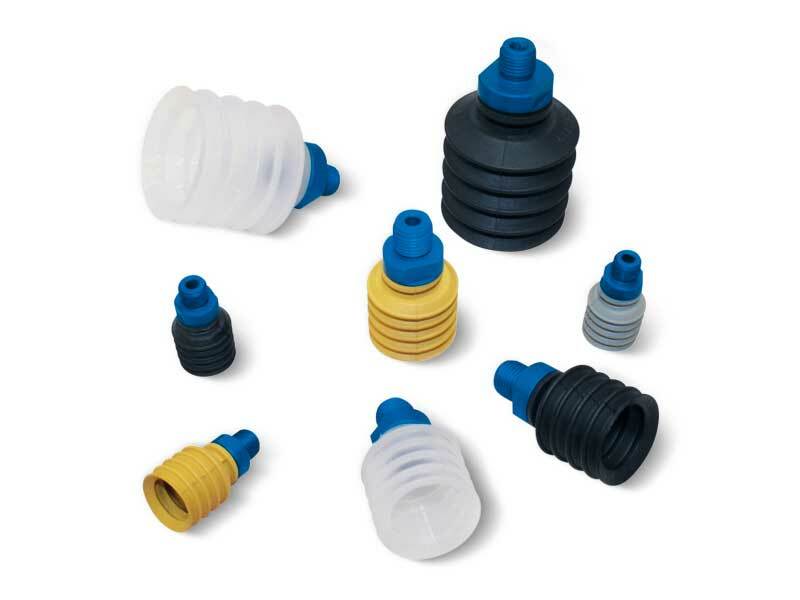 These cups are also available in natural para rubber and silicon. This series of couplings was designed to be installed on suckers with support, especially those that are flat or that have little lip, in order to allow them to easily adapt to the gripping surface of the load to be picked up, even if not perfectly parallel to the plane of the sucker itself or to compensate for any perpendicularity errors that often occur between the sucker holder and the fixing support of the automated device. The vacuum connection is axial and the hold is guaranteed by a special seal, always in contact with the ball joint. The sucker installed on them is free to rotate 360° degrees on its axis and to tilt up to 15°. The joints are made entirely of brass, with the exception of the ball pivot, which is made of stainless steel. 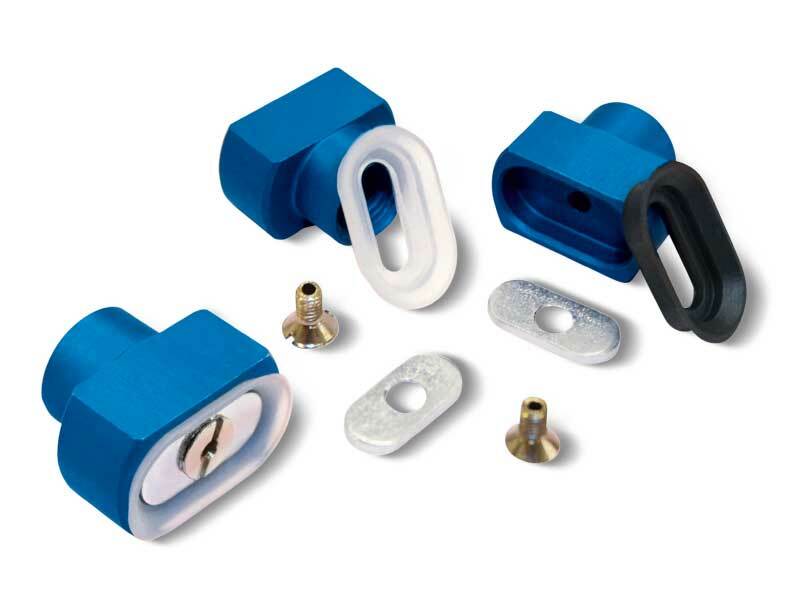 They can be fastened to the sucker using either the female or male threaded connection. 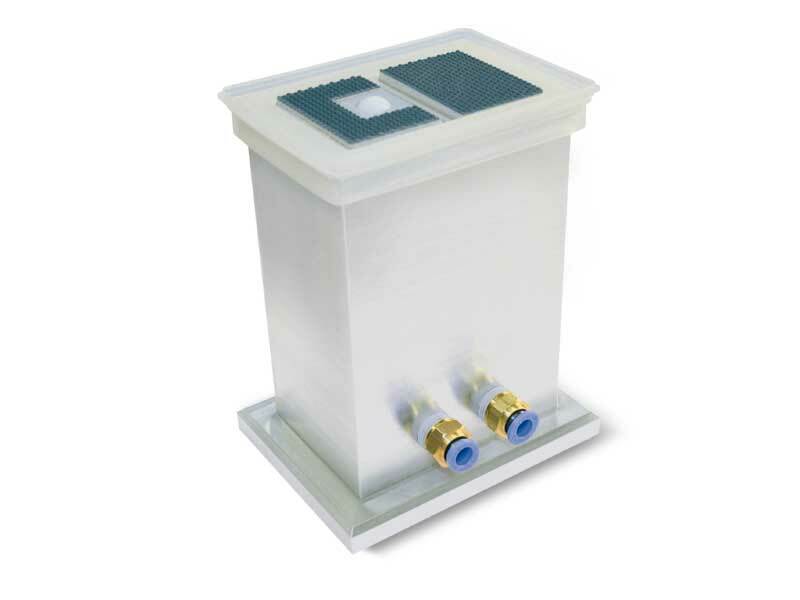 The cups described in this page have been designed to solve most of the gripping problems that can arise handling wooden or plastic panels, thin glass or marble sheets, fragile metal sheets, ceramic or baked clay tiles, etc. Their low, stong and slightly tilted lip does not swipe on the loading surface during the gripping phase. The cleats on the inside of these cups, along with reducing the volume of air to be sucked, create a perfect supporting surface which prevents any gripping surface deformation as well as the vertically lifted load from slipping. 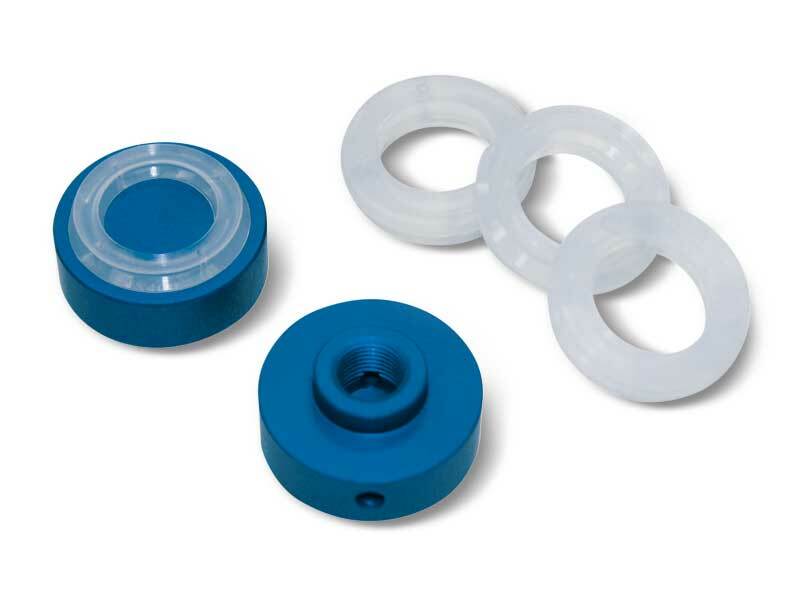 These cups can be coldassembled, with no adhesives, onto their anodised aluminium support and locked by the ring nut. These cups are extremely easy to replace; for the spare part, in fact, all you have to do is request the cup indicated in the table in the desired compound. The cups described in this page has been designed for gripping soft drink cans. 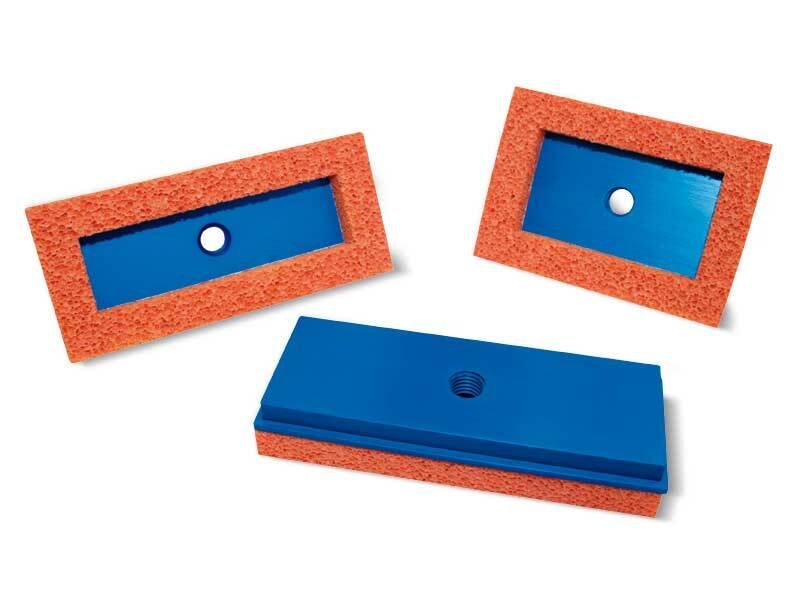 They can obviously be also used for gripping other objects with flat smooth or slightly rough surfaces. The shape of its lip allows a firm grip of the load to be handled, eliminating any oscillation and reducing the air volume contained within, thus allowing a quicker grip and release. 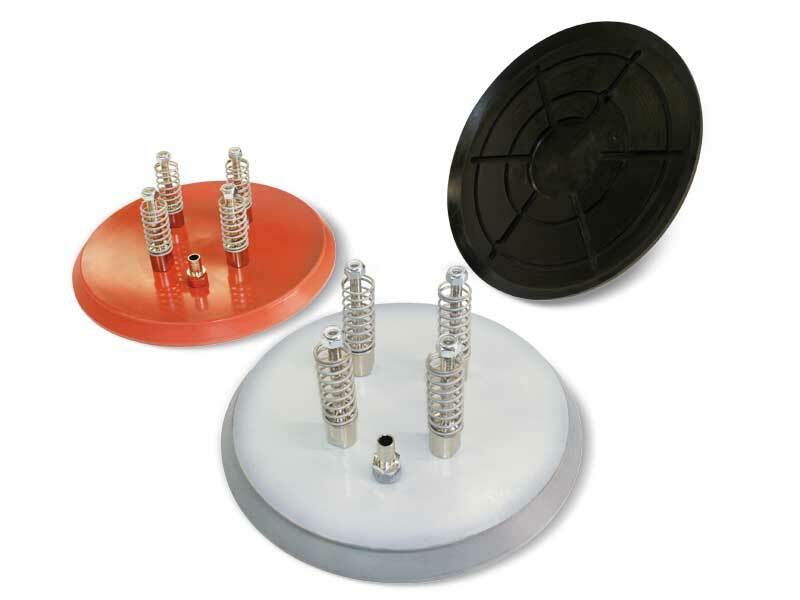 These cups can be cold-assembled, with no adhesives, onto their anodised aluminium support equipped with a threaded hole in the centre to allow their fastening to the machine. 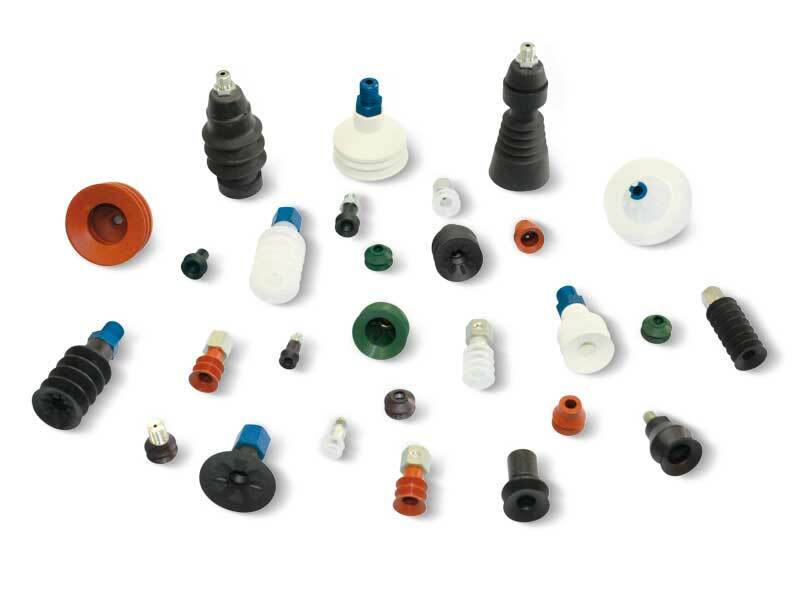 These cups are extremely easy to replace; for the spare part, in fact, all you have to do is request the cup indicated in the table in the desired compound. These cups feature a particularly thin and soft lip, which allows it to grip very rough surfaces. Its supporting surface with cleats guarantees a firm grip on the load to be handled. 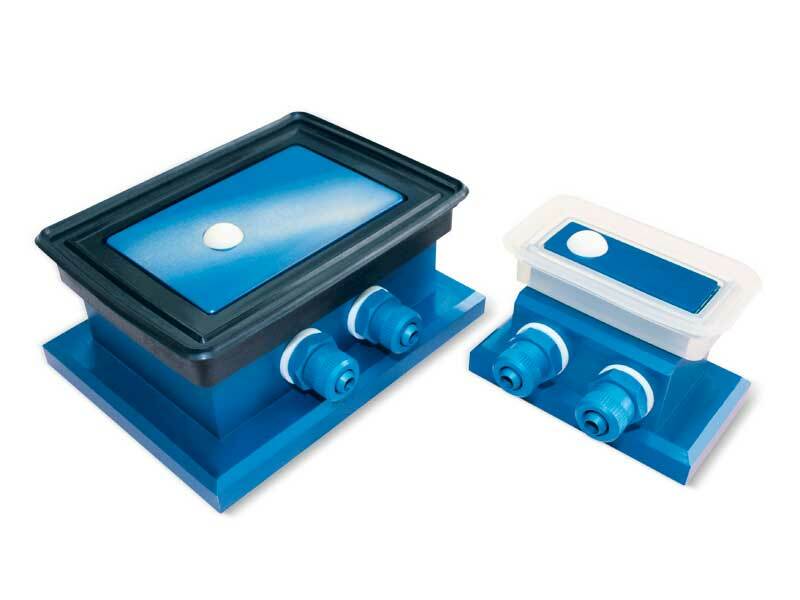 These cups have been specially designed for gripping ceramic tiles with smooth, rough and non-slip surfaces, although, due to their features, they can also be used for handling glass, marble and cement manufactures. These cups can be cold-assembled, with no adhesives, onto their anodised aluminium support equipped with a threaded hole in the centre to allow their fastening to the machine. These cups are extremely easy to replace; for the spare part, in fact, all you have to do is request the cup indicated in the table in the desired compound. These cups have been designed, in particular, for handling metal sheets, glass, wooden panels, marble granite and other similar materials. The shape of its lip allows a firm grip of the load to be handled, eliminating any oscillation and reducing the air volume contained within, thus allowing a quicker grip and release. 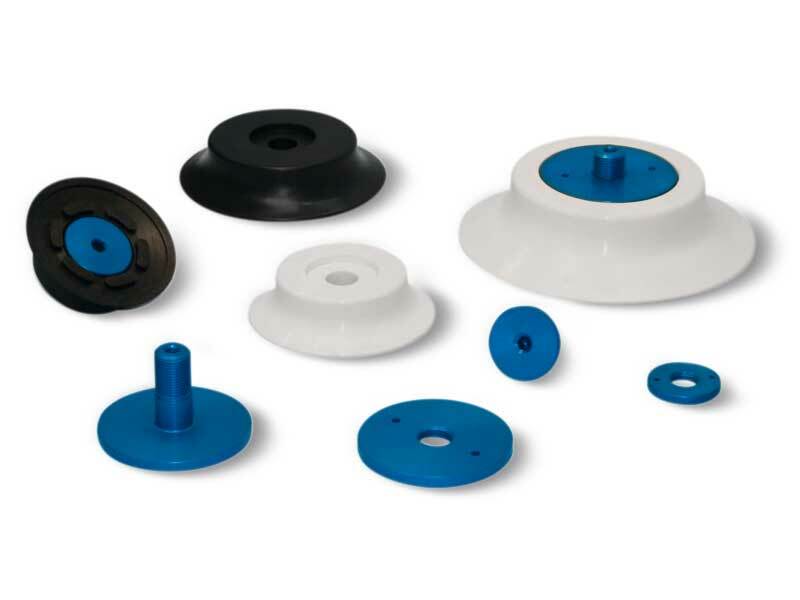 These cups are provided with cleats which, besides avoiding the load to bend in correspondence of the gripping point, also have the purpose to increase the friction surface with the vertically lifted load, preventing it from slipping. They are normally available in the three standard compounds, but can be supplied in special compounds and in a minimum amount to be defined in the order, upon request. 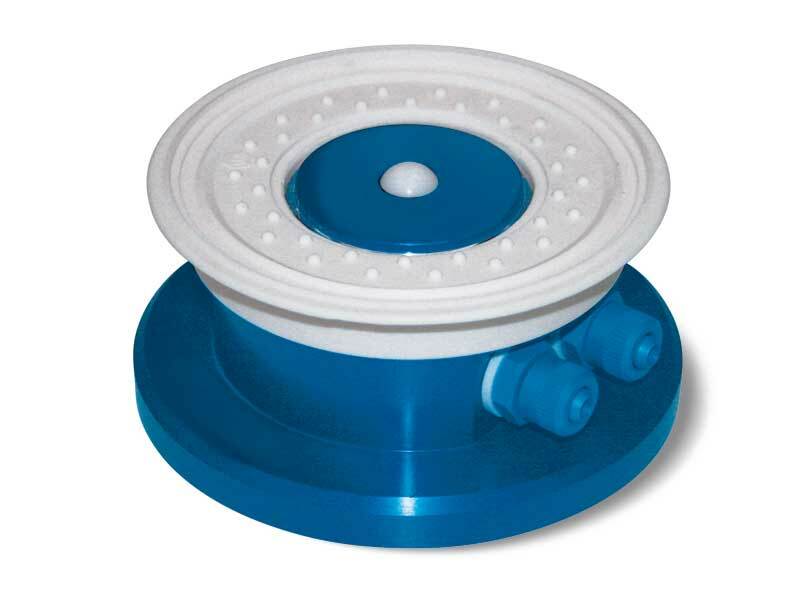 These cups can be cold-assembled, with no adhesives, on their anodised aluminium support equipped with a threaded hole in the centre to allow its fastening to the machine and, upon request, it can be supplied with a side hole with gas thread for the suction fitting. 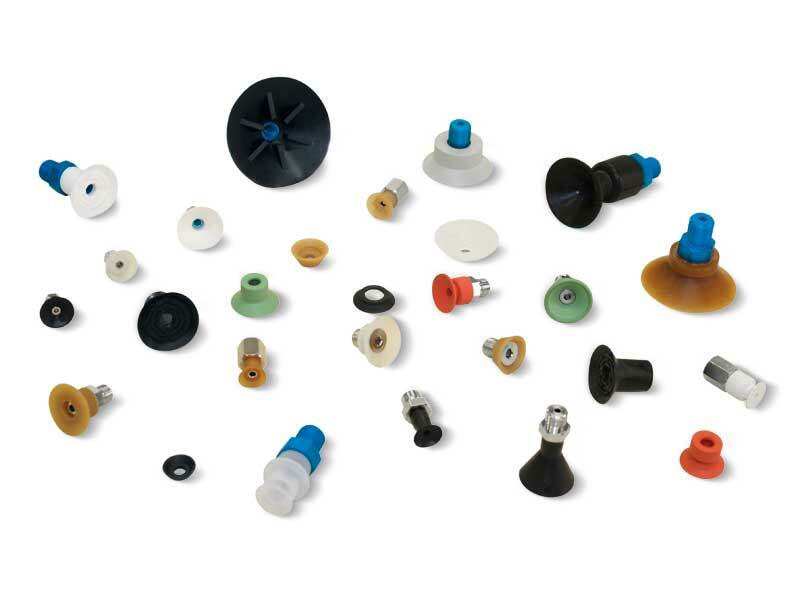 These cups are extremely easy to replace; for the spare part, in fact, all you have to do is request the cup indicated in the table in the desired compound. These foam rubber cups are made with a special compound called GERANIUM, with a density that allows them to grip even uneven and very rough surfaces maintaining their elasticity also after many working cycles. 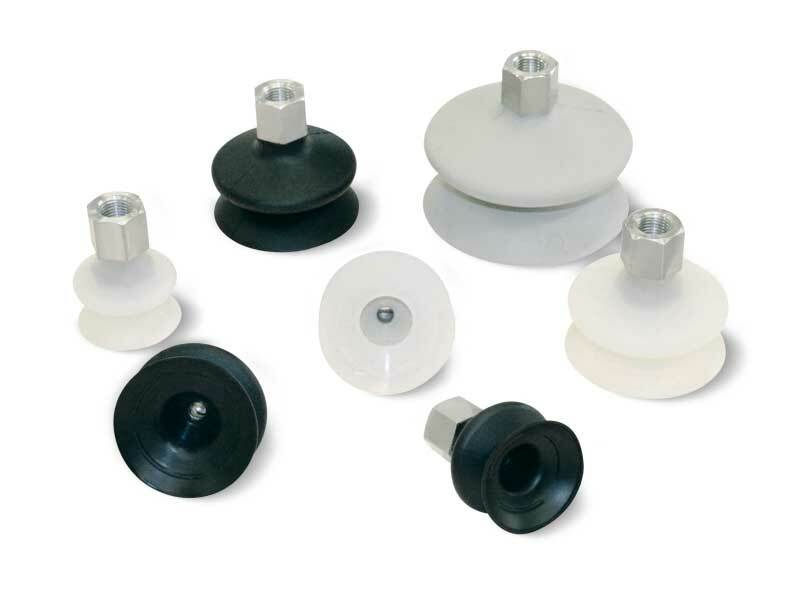 They are provided with self-adhesive side for a quick fixing to their support. This series of cups has been designed for handling loads with raw or very rough surfaces (sawn, bushammered or flamed marble, textured, non-slip or profiled metal sheets, striped plexiglas, raw cement manufactures, garden tiles with fret, etc.) and in all those cases in which traditional cups cannot be used. In case of lubricated gripping surfaces, we recommend using NF neoprene foam rubber. The working temperature range is between -40 °C and +80 °C for OF GERANIUM foam rubber and between -20 °C and +80 °C for NF neoprene. Their supports are made with anodised aluminium and are provided with a threaded hole in the centre for fastening them to the machine. The larger ones, on the other hand, have a side threaded hole for vacuum connection. For the spare part, all you have to do is request the self-adhesive foam rubber cup indicated in the table, in the required compound. The manufacturers of glass and marble machining centres require increasingly accurate and safe clamping systems. This has led us to creating this new series of cups. They are vulcanised onto a steel support and are provided with a hole in the centre for vacuum connection or for a BALL VALVE, as well as with 3÷4 holes on the internal circumference for housing allen screws. Their extremely flexible lip allows them to easily adapt themselves to the sheets to be held, with no risk of deformation or rupture, even for the thinnest ones. 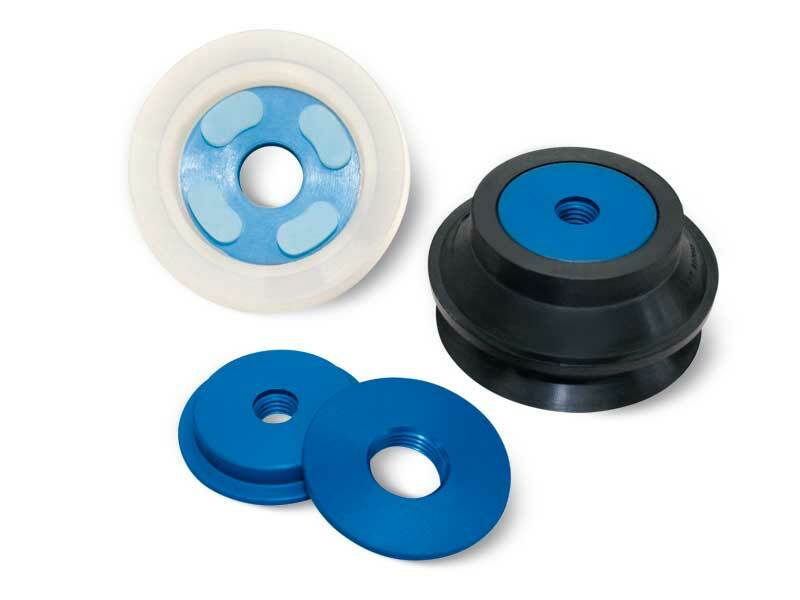 The particular internal support plane of these cups ensure a high friction coefficient with the gripping surface and especially a considerable grip on wet glass and marble sheets, thanks to the water drainage. All this guarantees a firm and safe grip. Furthermore, these cups feature the highest accuracy of their thickness, whose nominal height has a tolerance of only five hundredths of millimetre. 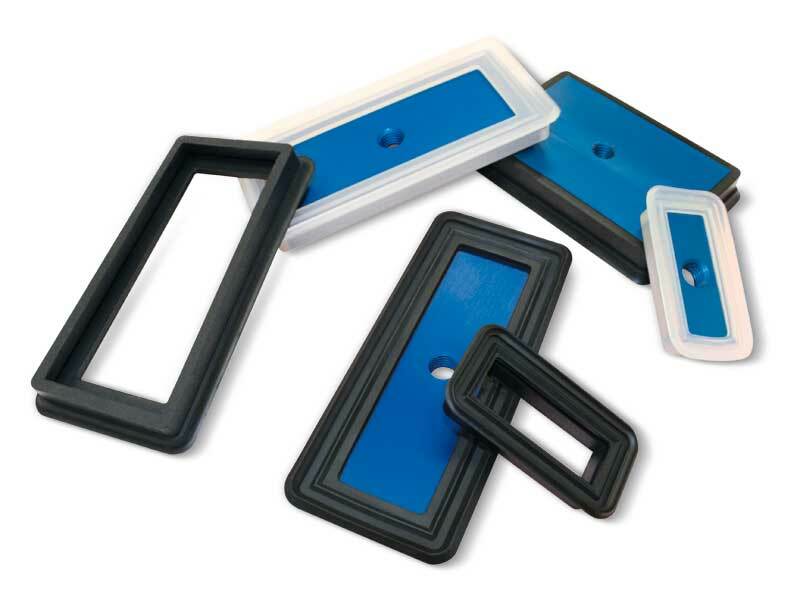 They are normally produced with oil-resistant rubber A, but they can be ordered in other compounds, shown on top, upon request and in minimum quantities to be defined in the order. These cups have been designed for lifting and handling heavy loads, both vertically and horizontally. 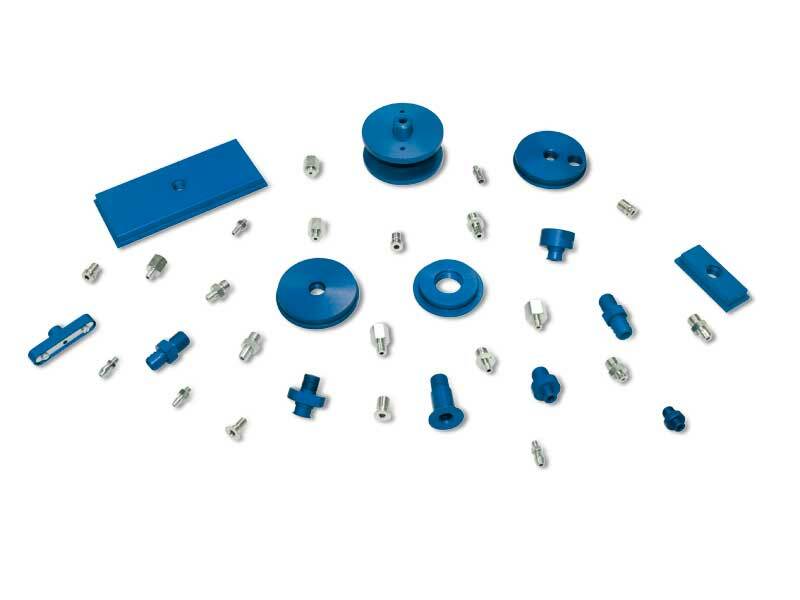 They are vulcanised onto a steel support and are provided with a central threaded hole for its fastening to the machine and with a side threaded hole for vacuum connection. These cups have a labyrinth graved face made with the same compound as the cup, which allows gripping even the thinnest and most fragile glass and marble sheets, with no bending in the gripping area. The shape of its lip and the choice of the compound whith which they are made with, ensure a firm grip on uneven and corrugated surfaces. The 08 .. 40 series, along with sharing the same features, have an internal vertical lip which allows them to grip extremely rough surfaces, such as embossed or profiled metal sheets, sawn marble or granite, wooden boards, precast cement, etc. These cups are recommended for handling very heavy loads both vertically and horizontally. They are vulcanised onto a steel support and have a labyrinth graved face made in the same compound as the cup. The support is provided with four steel pins with self-locking nuts for guiding the cups and fastening them to the machine, as well as with a threaded sleeve for vacuum connection. Morever, these cups are provided with four springs to cushion its impact with the load to be lifted. These cups are available in the three standard compounds. These cups have been designed for lifting objects with a central hole. 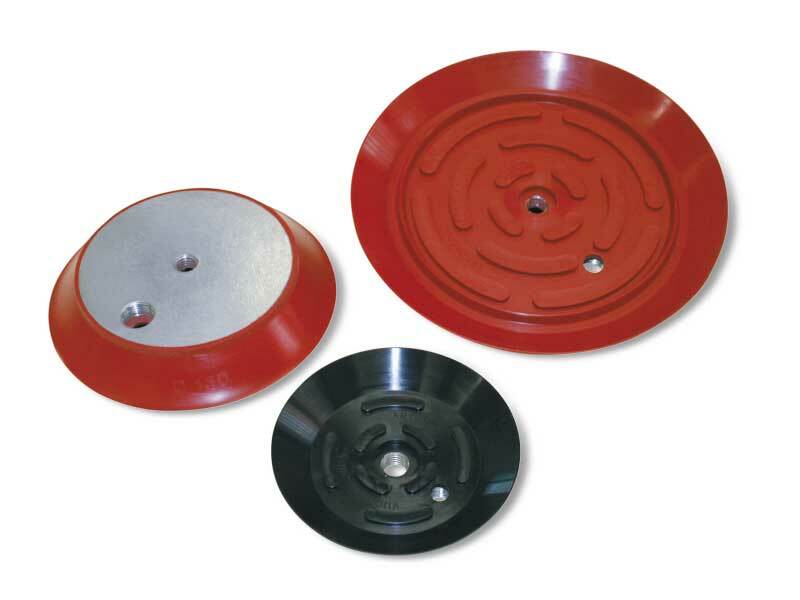 Their very thin lip allow them to grip very rough surfaces, such as grinding wheels and discs. 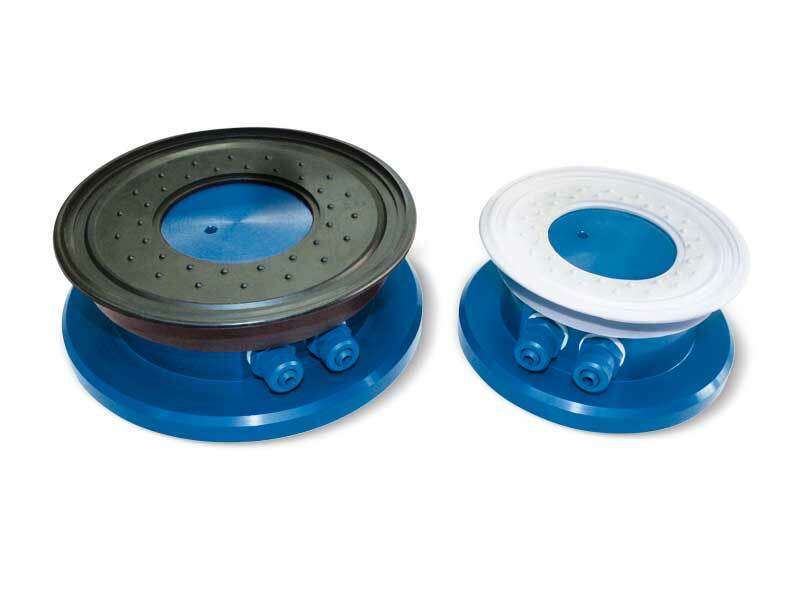 They are particularly recommended for handling CDs,perforated discs, toothed wheels, pulleys and other similar objects. 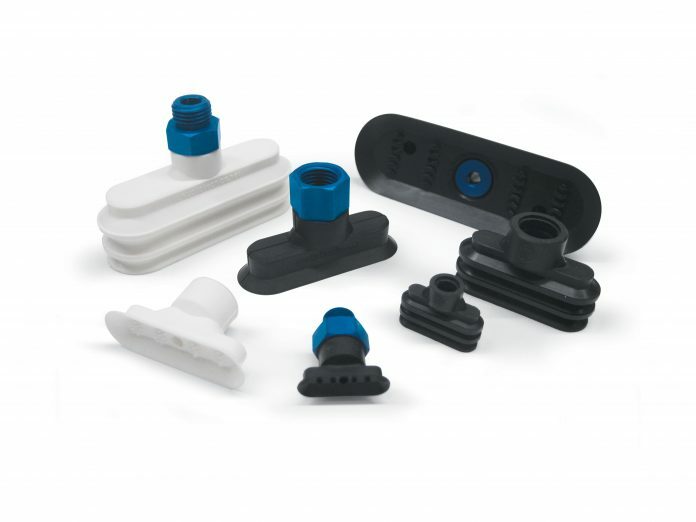 Their supports are made with anodised aluminium and are provided with a threaded hole in the centre to allow suction, as well as its fastening to the machine. The cups are cold-assembled onto them, with no adhesives. 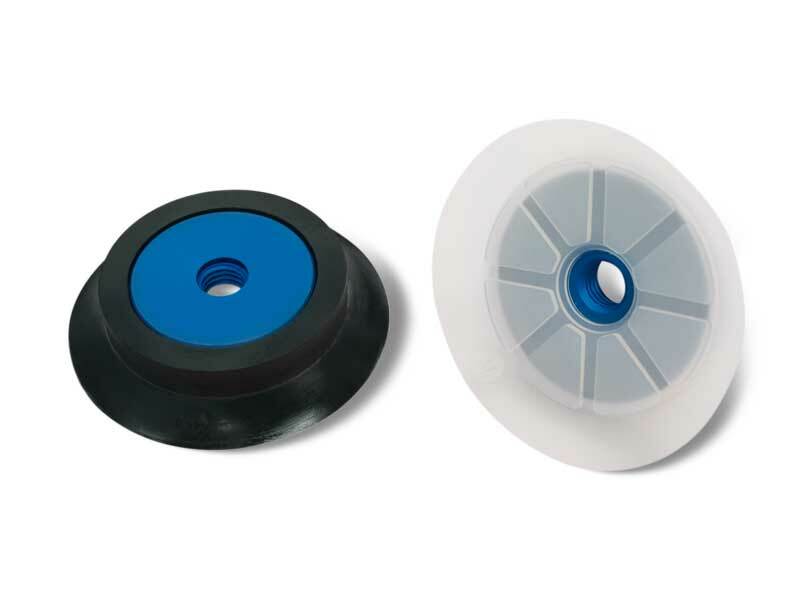 To guarantee maximum flexibility, the cups for gripping grinding discs are made with natural para rubber N, while those for handling CDs are made with silicon S. Cups in special compounds shown on top can be provided upon request in minimum quantities to be defined in the order. For the spare part, all you have to do is request the cup indicated in the table in the desired compound. 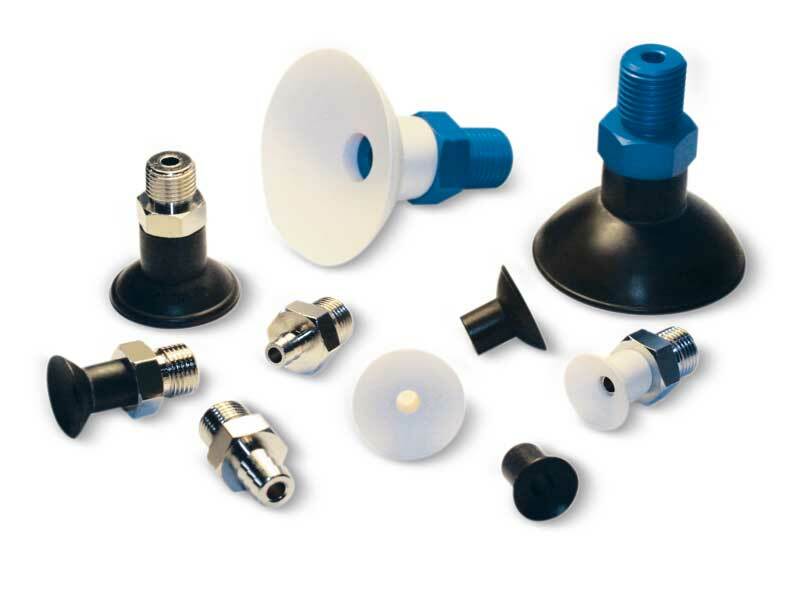 These cups are recommended for working surfaces for clamping wooden panels, marble, granite, ceramic, glass, etc. They are obviously used to handle these materials. Their vertical and low lip allows for a firm grip on the surface to be clamped or handled, eliminating any oscillation and considerably reduces the air volume contained within, thus ensuring a quicker gripping and release. Cups in special compounds indicated at page 21 can be provided upon request in minimum quantities to be defined in the order. They can be cold-assembled, with no adhesives, onto an anodised aluminium support, provided with a central threaded hole to ease its fastening to the machine. Larger supports are provided with two threaded holes equidistant from the centre, to allow the possible insertion of guiding anti-rotation pins. For the spare part, all you have to do is request the cup indicated in the table shown in the top in the desired compound. These cups share the same technical and mechanical features with the ones described above, but their support has a special non-slip plastic coating that make them particularly suited for clamping glass and smooth marble. 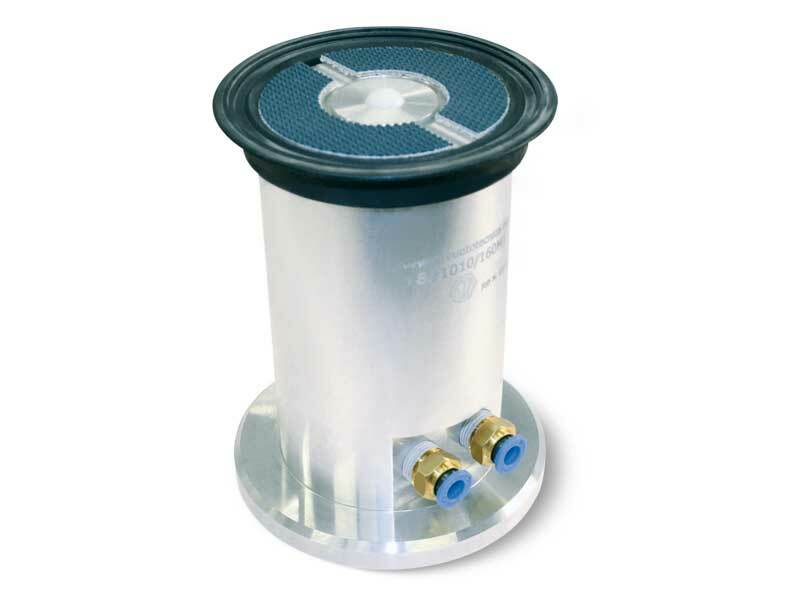 A built-in stainless steel mesh filter in the suction hole and an O-ring seal at the base of their support are the other main features of these cups. 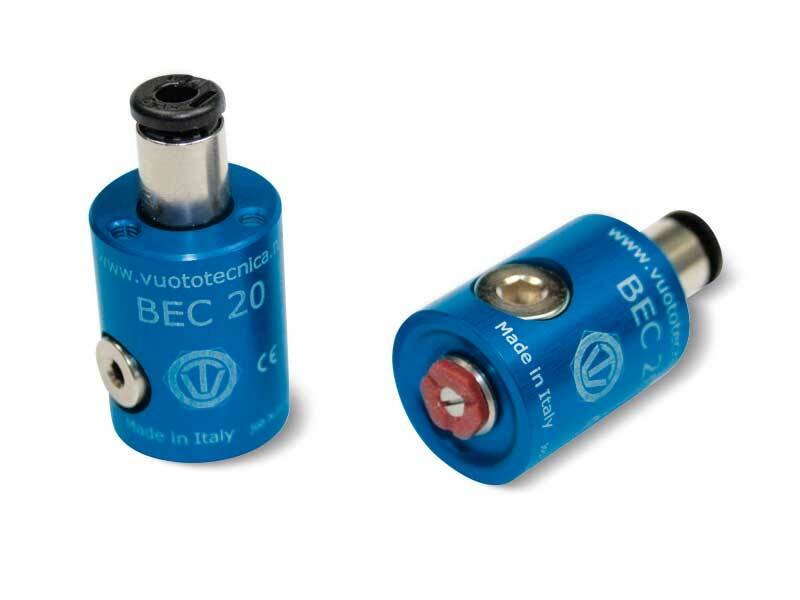 They are also provided with two or for housings for TCCE screws, according to their size, for fixing them to the workstation. Foam rubber cups are made with a special compound called GERANIUM indicated with OF, with a density that allows them to grip uneven and very rough surfaces and still maintain their elasticity even after many working cycles. These foam rubber cups have a self-adhesive side for a quick fixing to their support. These cups have been designed for handling loads with raw or very rough surfaces (sawn, bushammered or flamed marble, textured, non-slip or profiled metal sheet, striped plexiglas, raw cement manufactures, garden tiles with fret, etc.) and for all those cases in which traditional cups cannot be used. 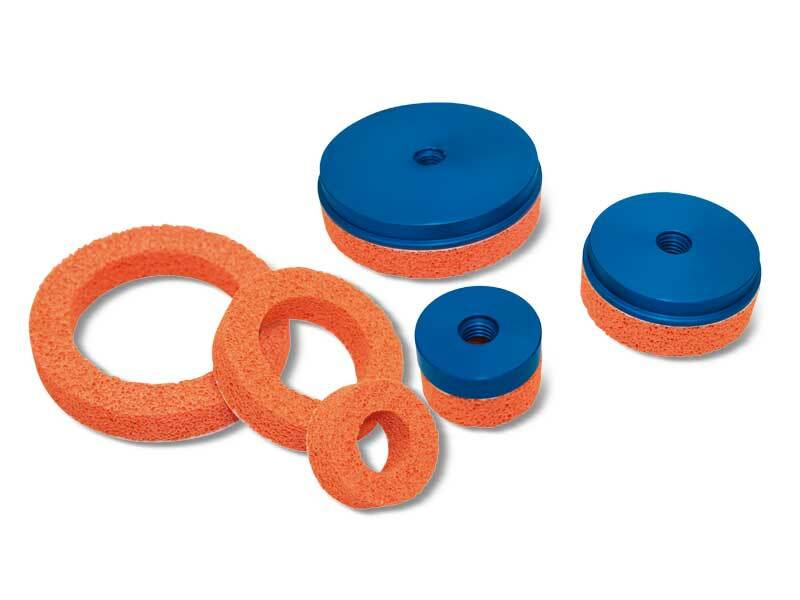 In case of lubricated gripping surfaces, we recommend using neoprene foam rubber NF. The working temperature ranges from -40 °C to +80 °C for GERANIUM foam rubber OF and from -20 °C to +80 °C for neoprene foam rubber NF. Their supports are made with anodised aluminium and they are provided with a central threaded hole to allow its fastening to the machine. Larger supports, on the other hand, are provided with two threaded holes equidistant from the centre, for the possible insertion of guiding, anti-rotation pins. For the spare part, all you have to do is request the cup indicated in the table in the desired compound. The manufacturers of glass and marble machining centres require increasingly accurate and safe clamping systems. This has led us to creating this new series of cups. They are vulcanised onto a steel support and are provided with a hole in the centre for vacuum connection or for a BALL VALVE, as well as with 2 holes on the internal circumference for housing allen screws. Their extremely flexible lip allows them to easily adapt themselves to the sheets to be held, with no risk of deformation or rupture, even for the thinnest ones. 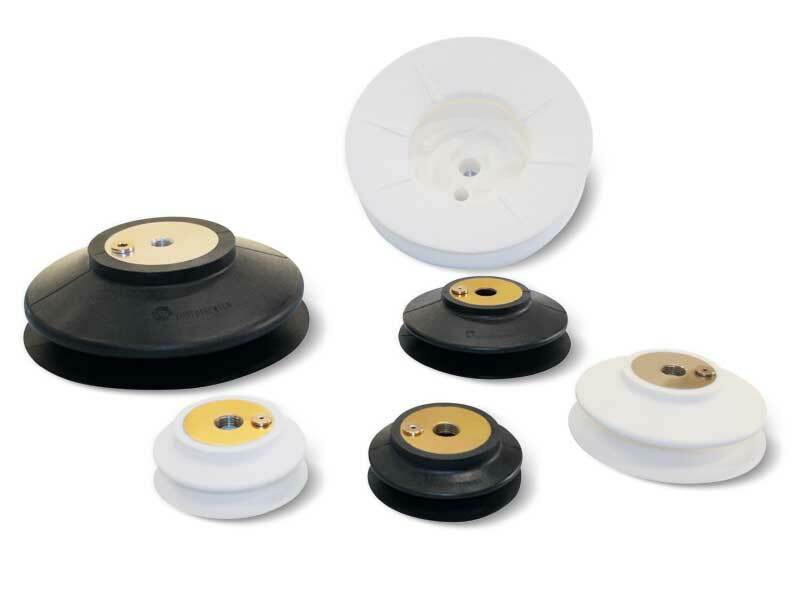 The particular internal support plane of these cups ensure a high friction coefficient with the gripping surface and a considerable grip on wet glass and marble sheets, thanks to the water drainage. All this guarantees a firm and safe grip. Furthermore, these cups feature the highest accuracy of their thickness, whose nominal height has a tolerance of only five hundredths of millimetre. 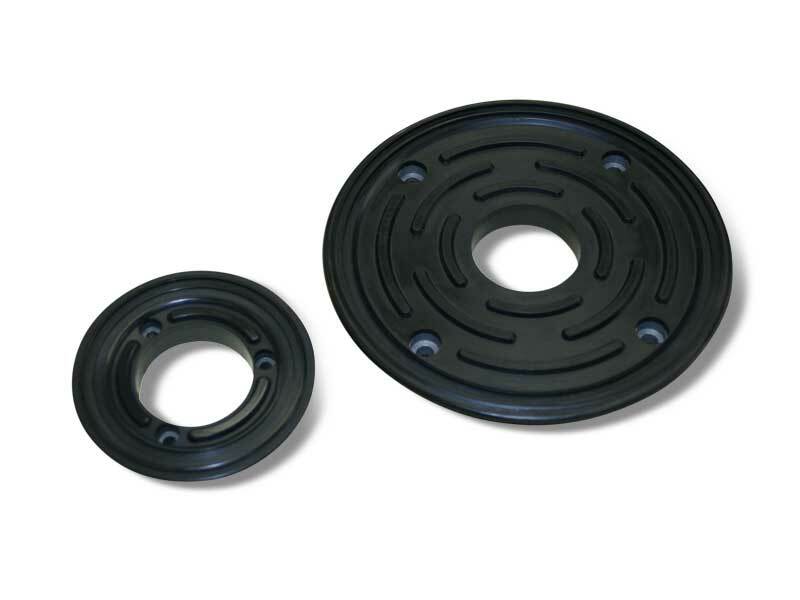 They are normally produced with oil-resistant rubber A, but they can be ordered in other compounds, shown on top, upon request and in minimum quantities to be defined in the order. These oval cups are are recessed on moulders in order to hold a side of the cardboard box during the moulding process by means of traditional cups on the opposite side. Once assembled with their support, they can be used for handling boxes, plastic objects or anything with a limited gripping suface. Their anodised aluminium support have a central threaded hole to fasten it to the machine. 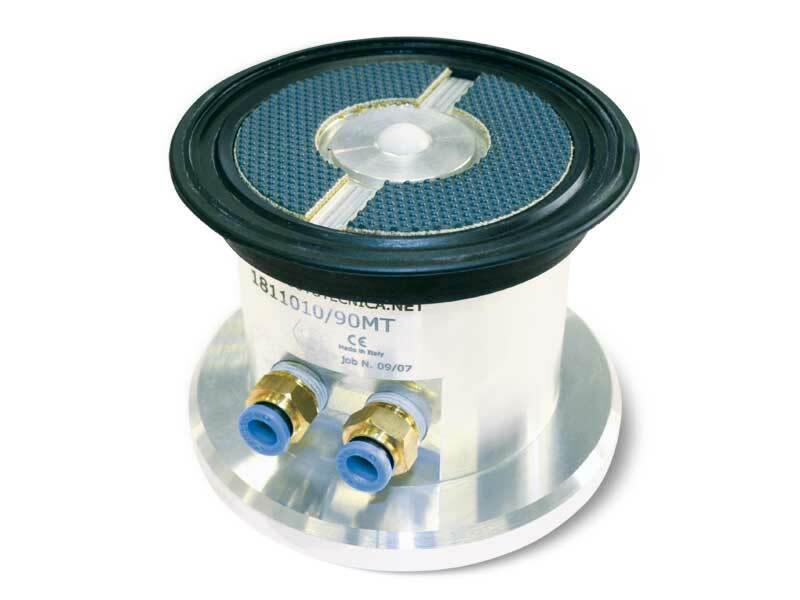 They are also provided with a nickelplated brass plate to hold the cup in its housing and with one or two stainless steel screws for fixing them. For the spare part, all you have to do is request the cup indicated in the table in the desired compound. The cups described in this page have been designed for for handling X-ray sheets in hospital or other electrostatically charged films. Their shape allows them to pick up one sheet at a time without deforming or crumpling the gripping surface and without leaving stains or prints, thanks to the special compound with which they are made. Their aluminium supports are vulcanised onto the cups. One with a smooth hole for fixing the cup to the machine with an allen screw, with the housing on the inside and one with a threaded hole. A side slot on the support prevents the cup from rotating. These cups are recommended for gripping and handling magnetic sheets, plastic sheets, thin rubber sheets, laminated cardboard, etc. 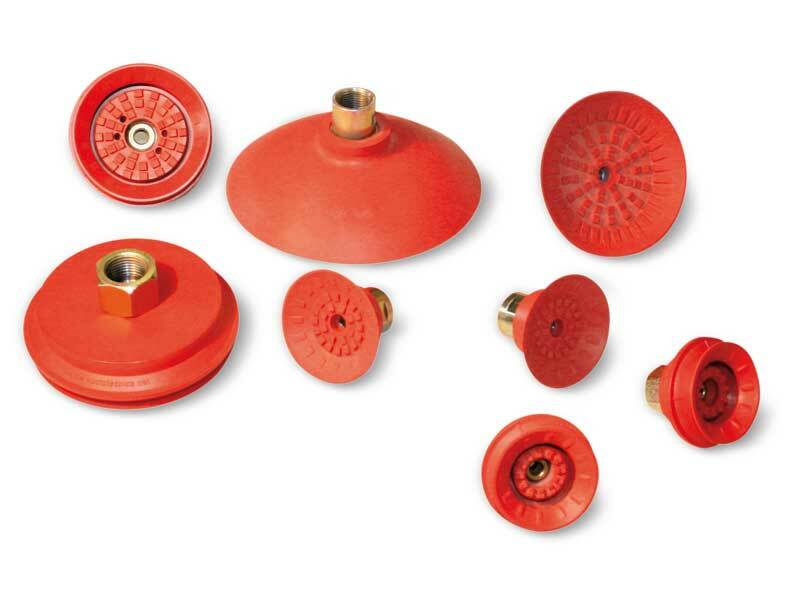 These cups have been designed for handling cylindrical objects, such as pipes, bottles, round profiles, etc. 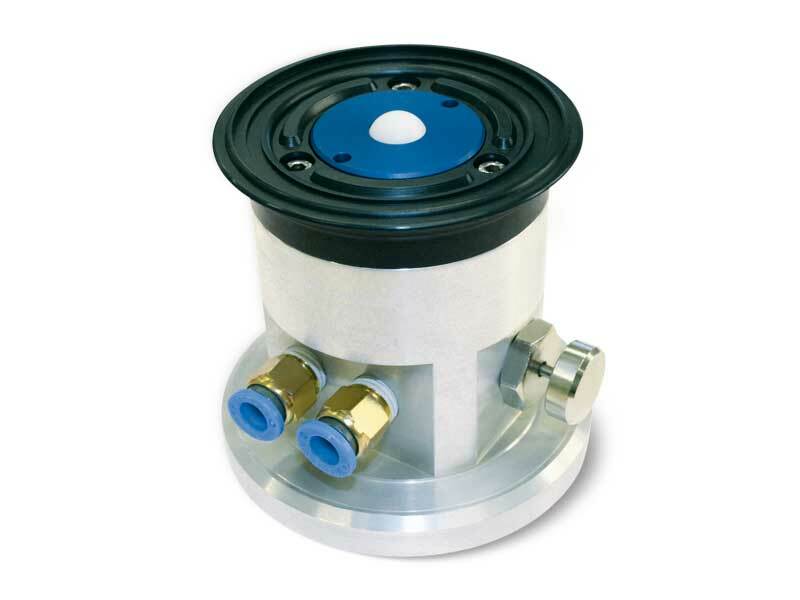 Its aluminium support is vulanised onto the cup and it is provided with a central threaded hole to ease its fastening to the machine and with a side hole for the possible insertion of a guiding, anti-rotation pin. These cups can be provided in the three standard compounds: oil-resistant rubber A, natural para rubber N and silicon S.
The foam rubber used for our cups can be provided in sheets or strips of the sizes indicated in the table. Both the strips and the sheets have a self-adhesive side which allows a quick and easy fixing to the metal support. 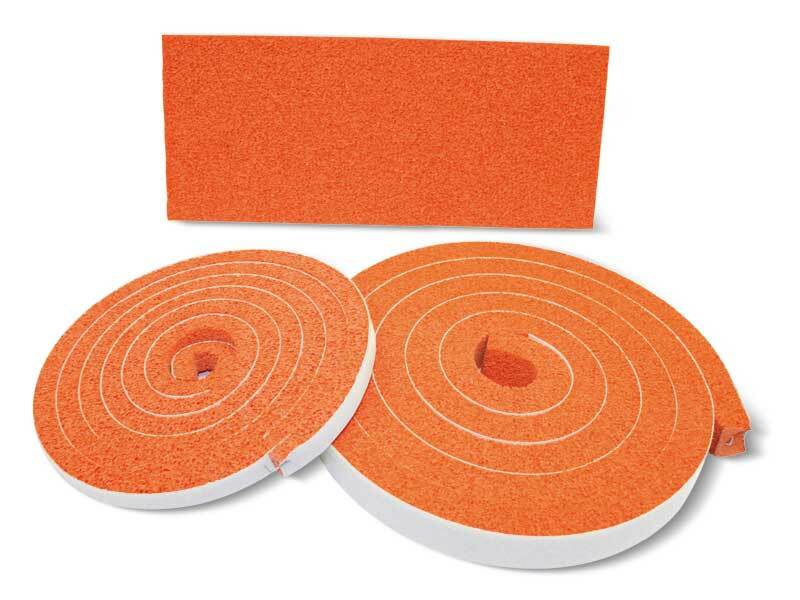 These sheets and strips can be used to make cups of every shape and to handle loads with raw or very rough surfaces. They can be supplied in different sizes and density upon request and in quantities to be defined in the order. The working temperature ranges from -40 °C to +80 °C. Note: GERANIUM foam rubber is obtained from the expansion of a natural rubber via a chemical-thermal treatment. The surface porosity can, therefore, vary without affecting its efficiency. The BELLOW CUPS described in these pages have been specially designed for handling baked goods, such as bisuits, bread, pizza, etc., as well as plastic or paper bags containing chocolates, sweets, pasta, flour, powder, etc. Thanks to their great flexibility, they can also be used to compensate flatness errors or for gripping on inclined surfaces. Their anodised aluminium supports are provided with a threaded male or female central pin to allow suction and to fasten it to the machine. The cups can be assembled onto them with no adhesives. For the spare part, all you have to do is request the cup indicated in the table in the desired compound. The cups described in these pages share the same features with the previously described BELLOW CUPS, only these have larger dimensions that allow them to lift much heavier loads; moreover, their anodised aluminium supports also have a central threaded hole for their fastening to the machine. The larger ones also have an additional side hole for vacuum connection. The difference is that these supports are provided with a disc instead of with a pin. These cups can be cold-assembled onto their supports with no adhesives. For the spare part, all you have to do is request the cup indicated in the table in the desired compound. This range of cups has been designed for gripping vertically stocked glass sheets. By laying the cup on the glass surface and opening the vacuum, the sheet will place itself orthogonally to the floor perfectly adhering to the cup internal face. The glass sheet can then be handled in any direction in full safety. Their aluminium aluminium support has a central threaded hole for fastening it to the machine and for the vacuum connection. The cups can be cold-assembled onto their support with no adhesives. 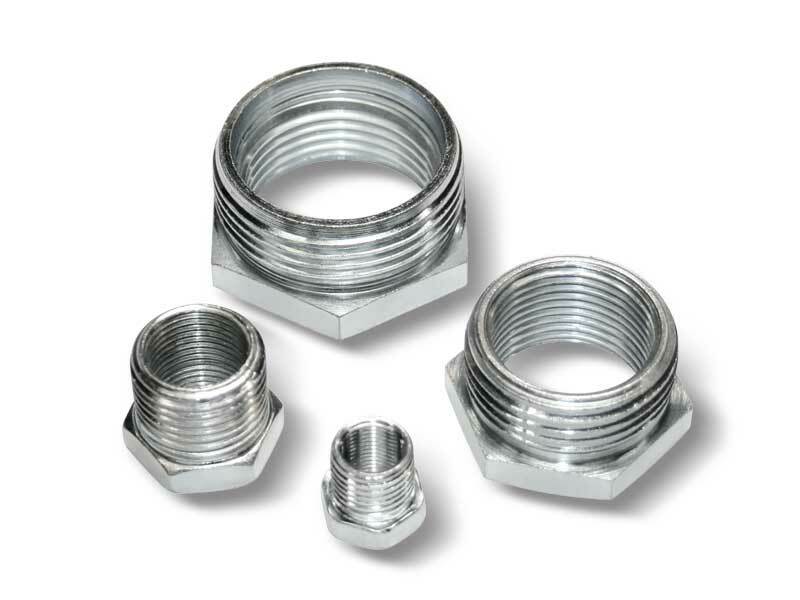 The cups described in this page, unlike the previous ones, are vulcanised onto an aluminium hexagonal support with a male or female threaded connector, inside of which there is an M8 threaded hole for the possible insertion of a calibrated grub screw (see page 1.118). 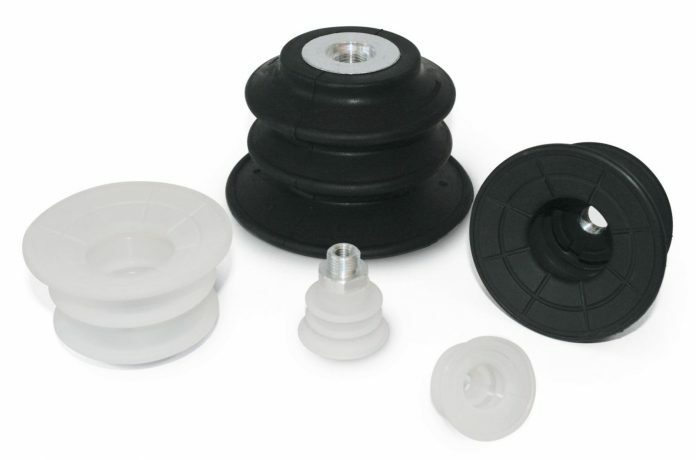 The main feature of these BELLOW CUPS is that they quickly crumple up during the grip, thus lifting the load for a few centimetres, independently of the movements of the lifting frame; this quick movement avoids that the load beneath,remains stuck to the lifted one. Due to this feature they are particularly suited for handling thin metal sheets, glass sheets, chipboard or compressed wood panels,laminated plastic etc. Due to their high flexibility they can also be used to compensate flatness errors or for the grip of inclined surfaces. These cups are available in the standard compounds and can be supplied in special compounds listed at page 21 in minimum amounts to be defined in the order. These cups are the same as the ones described in the previous page, only with an additional bellow. The technical features and availability are the same. The main feature of these BELLOW CUPS is that they quickly crumple up during the grip, thus lifting the load for a few centimetres, independently of the movements of the lifting frame; this quick movement avoids that the load beneath,remains stuck to the lifted one. Due to this feature they are particularly suited for handling thin metal sheets, glass sheets, chipboard or compressed wood panels,laminated plastic etc. Due to their high flexibility they can also be used to compensate flatness errors or for the grip of inclined surfaces. 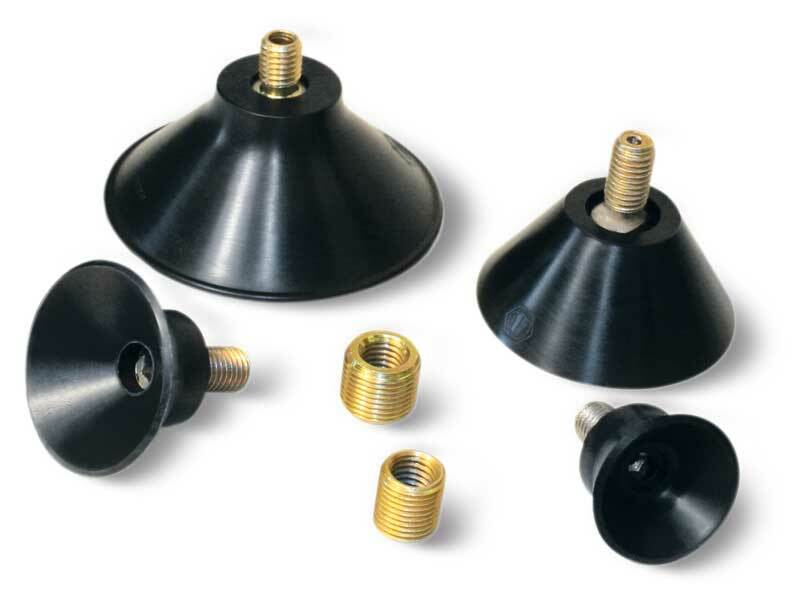 These BELLOW CUPS are vulcanised onto a galvanised steel or aluminium support provided with a central threaded hole for fastening it to the machine and a side one for the vacuum connection or for detecting the vacuum level. Also these cups are available in the three standard compounds. These cups have been designed to solve many of the gripping and handling problems we have encountered in over thirty years of activity. They differ from all the other cups for the variety of their shapes. They are suited for gripping CDs, labels, bags, paper or plastic sheets, stickers, cardboard, metal and plastic objects, biscuits, chocolates, etc. 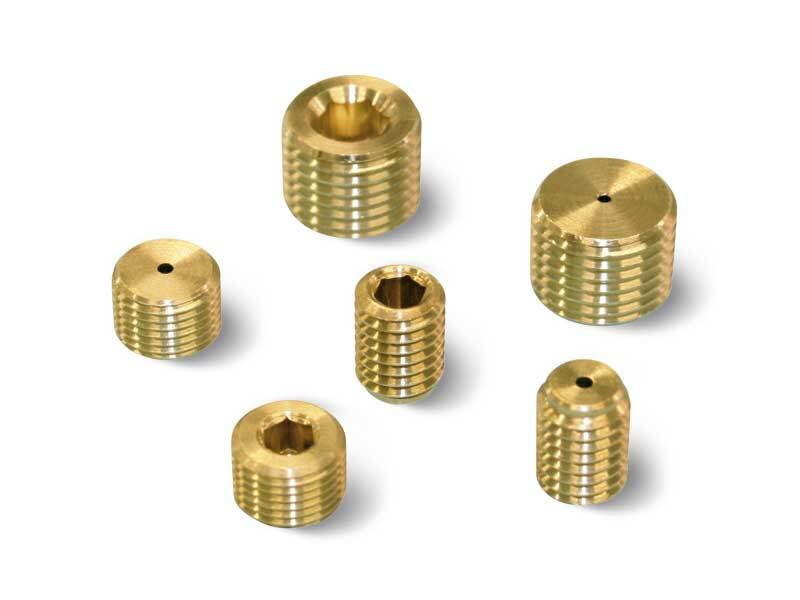 Their nickel-plated brass or anodised aluminium supports are provided with a threaded male or female pin to enable suction and to fasten them to the machine. These cups can be manually assembled onto their supports with no adhesives. They are available in the standard compounds, but they can also be provided in the special compounds shown on top in minimum amounts to be defined in the order. 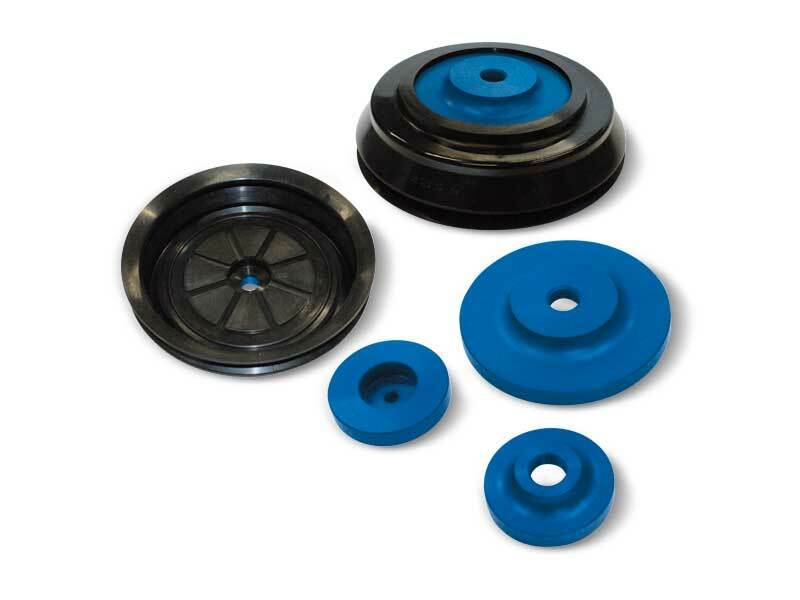 The main feature of these BELLOW CUPS is that they crumple up when in contact with surface to be gripped and in presence of a vacuum, thus creating a quick lifting movement independently from the machine. This rapid movement prevents the load beneath from remaining stuck to the lifted one. Due to their high flexibility they can also be used to compensate flatness errors or for the grip of inclined surfaces. The cups shown in these pages are the ideal solution for our customers; in fact, they have been designed for handling biscuits, chocolate, eggs, stickers, labels, metal and plastic objects, laminated plastic, paper and plastic bags, etc. Their nickel-plated brass or anodised aluminium supports are provided with a central male or female threaded pin that enables suction and allows to fasten them to the machine. These cups can be manually assembled onto their supports with a simple pressure and with no adhesives. They are available in the standard compounds and in the special ones listed at page 21 upon request. In the following pages are listed the cups for which each support is suited. They are specially shaped to perfectly adhere to the internal profile of the cups and they are provided with a male or female axial pin in order to allow suction, as well as to fasten them to the machine. 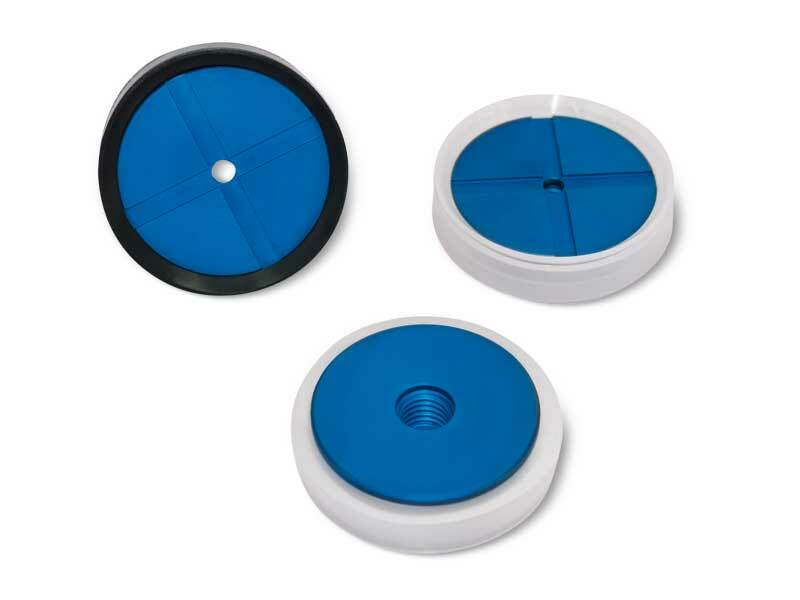 These cups can be manually assembled onto them with a simple pressure, with no adhesives. They are made with nickel-plated brass or anodised aluminium or with special materials upon request. 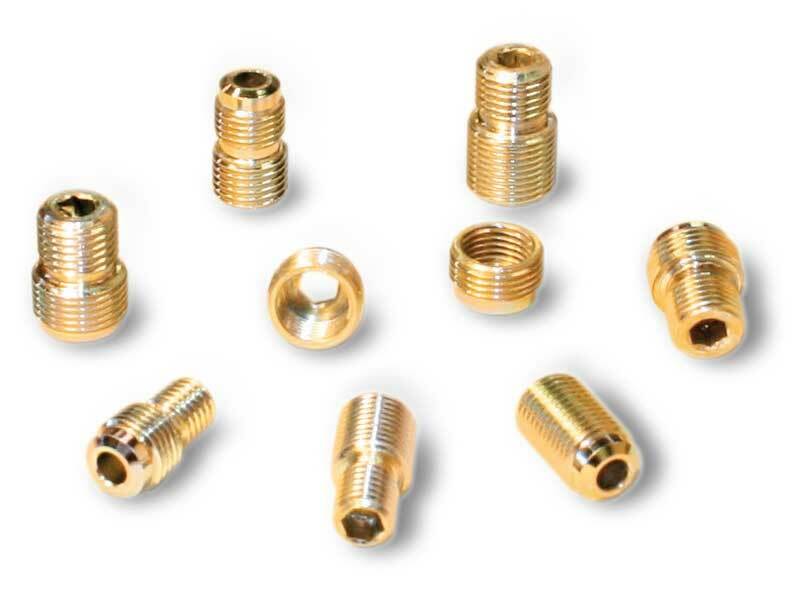 These adapters allow using NPT threaded fittings on vacuum components with gas threads, such as cups, valves and solenoid valves, filtres etc. 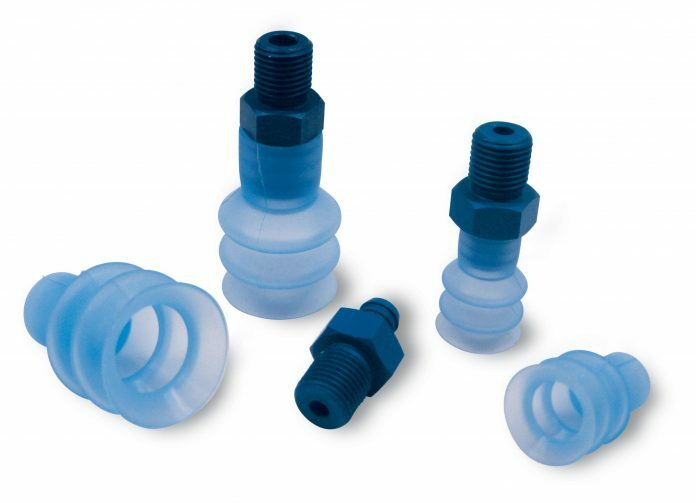 These threaded grub screws with calibrated hole are used to reduce the cup suction section, thus reducing vacuum losses in case the cup fails to grip. 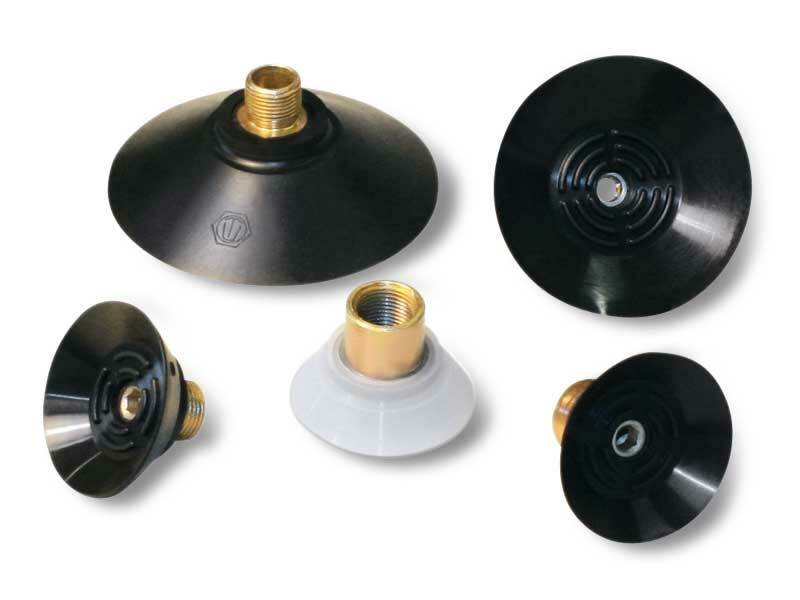 They are made with brass and can be inserted in all the cup supports set for this application. These cups do not require a connection to any vacuum source, since the object onto which they are laid on evacuates the air inside them. A built-in non-return valve prevents the air from entering again, thus maintaining the vacuum. To release the piece, it is sufficient to lift it a few millimetres, so to open the non-return valve, which restores the atmospheric pressure inside the cup, by letting the air in. Since possible losses cannot be recovered, these cups a recommended only for holding objects with smooth and impermeable surfaces, such as glass, polished sheets, and other similar objects. They are particularly suited for glass carrying trolleys feeding trolleys for robotic systems. They are made with nickel-plated brass with a steel drive bush, which can be provided in the anti-rotation version upon request. The main feature of these cups is that they open, and therefore they produce vacuum, only when the load to be handled activates the sealing ball. In this version, the gripping surface is limited by a silicon O-ring which guarantees the vacuum seal. 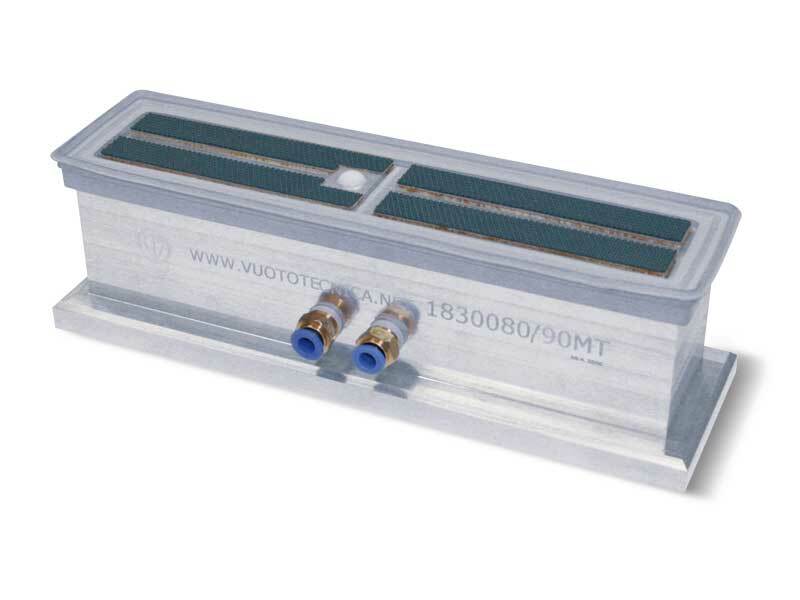 They have been specially designed for vacuum beds and they are fully made with anodised aluminium. The main feature of the special built-in cups is that they open, and therefore produce vacuum, only when the load to be clamped activates the sealing ball. Especially designed for the vacuum operated beds of woodworking machines, they differ from the previously described ones because of the high precision of their cylindrical support, which is ground to size, and because of their square closing block, which prevents the cup from rotating and enables connection to vacuum. The cold-assembled cups are the flat ones listed in the table in the various compounds. 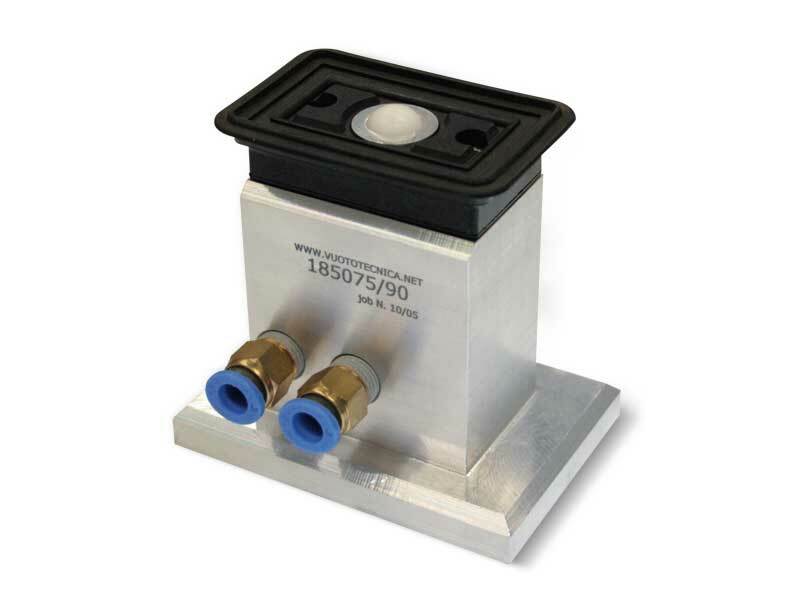 Their support is made with anodised aluminium, while the closing block is made with brass. These supports with retractable striking pins have been designed to allow a quick centering of the load to be clamped to the machine work surface via the cups. 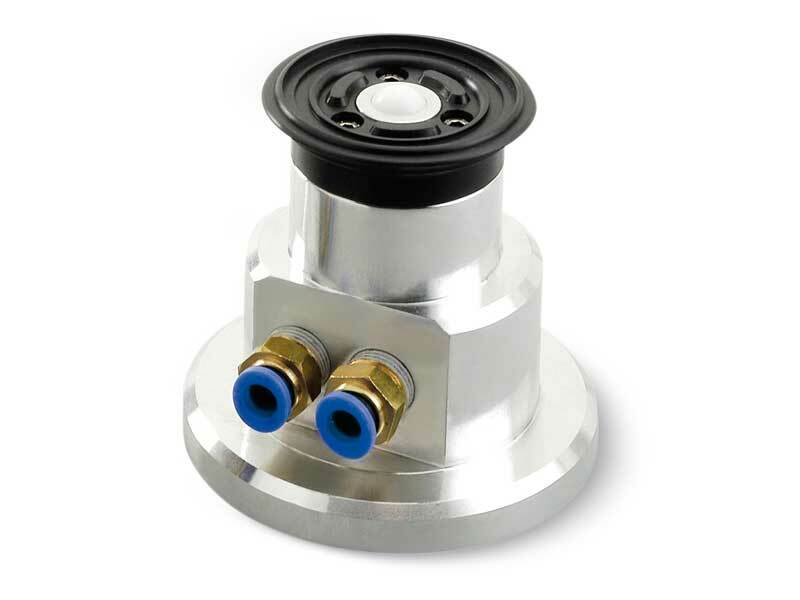 The striking pin is solidly connected to a piston and it is activated by the vacuum while retracting and while remaining in its housing and also by a stainless steel spring while coming out. These supports are mechanically fixed to the work surface. The striking pin is made with plastic material, while the support is made with anodised aluminium. As a standard they are equipped with a quick coupling for vacuum connection. - A sturdy anodised aluminium support with a wide surface at the base limited by a seal whose purpose is to fix it to the bearing surface. 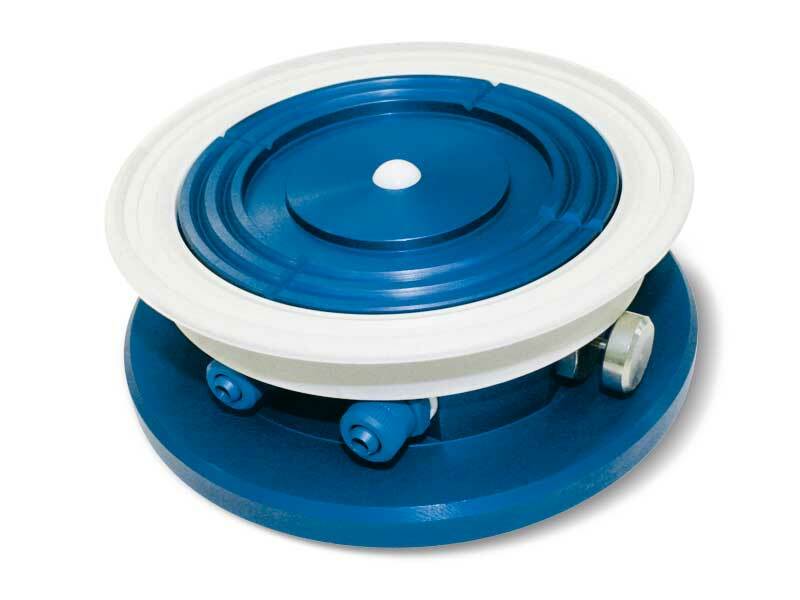 - A standard circular flat cup which is cold-assembled onto the upper part of the support for gripping the load. 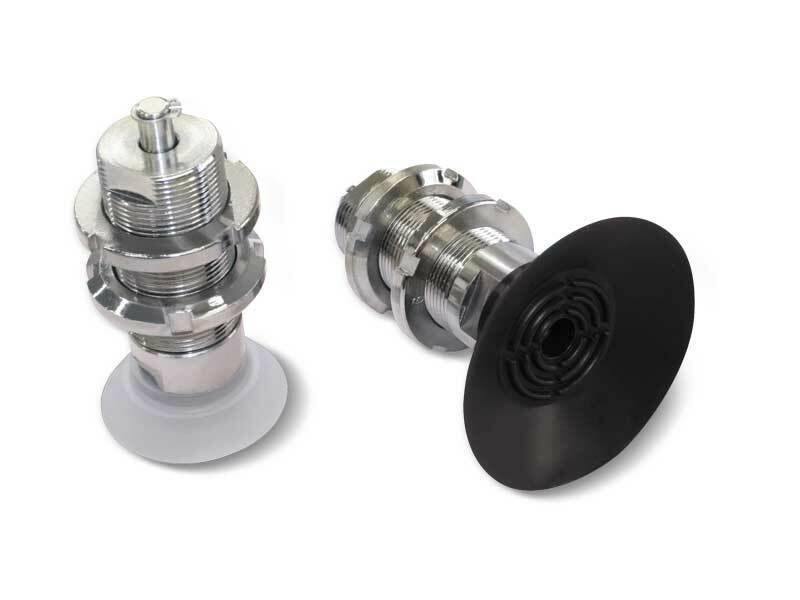 - Two quick couplings for vacuum connection. The detection of vacuum, for gripping and releasing the support, can be made via three-way vacuum valves or solenoid valves. All cups with self-locking support of this and other ranges with the gripping plane at the same height can be used simultaneously, even if they are of different types or have different sizes. 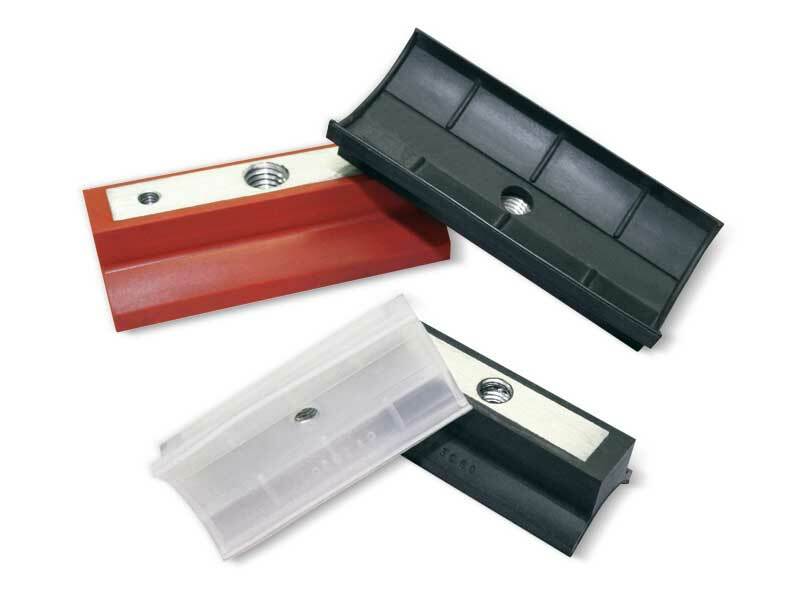 - A standard rectangular flat cup which is cold-assembled onto the upper part of the support for gripping the load. - A sturdy anodised aluminium support with a wide surface at the base limited by a seal, whose purpose is to fix it to the bearing surface. 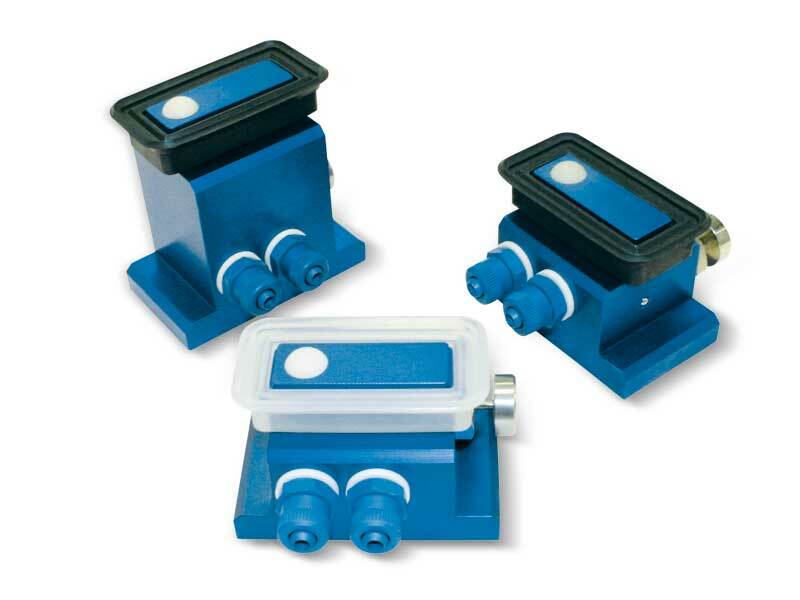 - A ball valve that opens up creating vacuum, only when activated by the load to be gripped. The gripping plane of these cups is covered with a special non-slip plastic coating, which is particularly suited for clamping glass and smooth marble. The detection of vacuum, for gripping and releasing the support, can be made via three-way vacuum valves or solenoid valves. All cups with self-locking support of this and other ranges with the gripping plane at the same height can be used simultaneously, even if they are of different types or have different sizes. Note: Available with support for mechanical fixing with code 28, instead of 18. The detection of vacuum, for gripping and releasing the support, can be made via three-way vacuum valves or solenoid valves. All cups with self-locking support of this and other ranges with the gripping plane at the same height can be used simultaneously, even if they are of different types or have different sizes. Note: Available with support for mechanical fixing with code 28, instead of 18. The detection of vacuum, for gripping and releasing the support, can be made via three-way vacuum valves or solenoid valves. 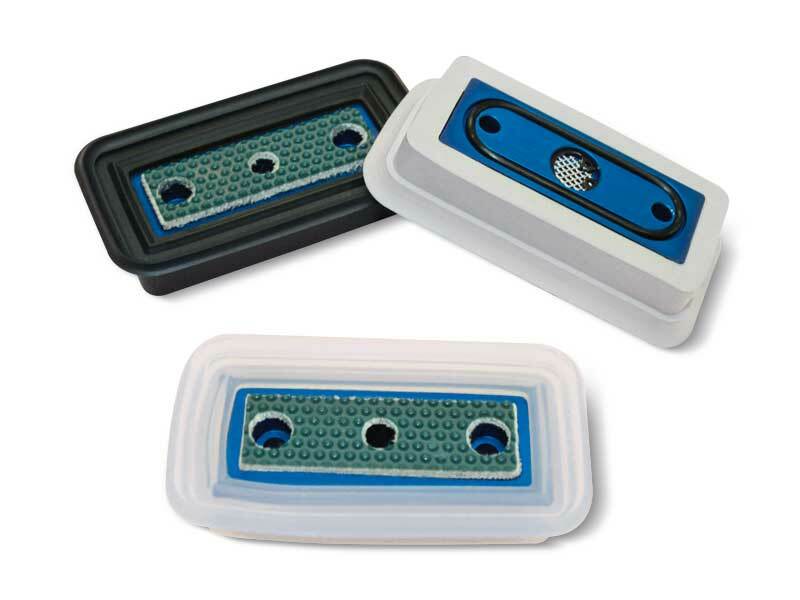 - A release button that allows placing the support even with the vacuum inserted. The gripping plane of these cups is covered with a special non-slip plastic coating, which is particularly suited for clamping glass and smooth marble. The detection of vacuum, for gripping and releasing the support, can be made via three-way vacuum valves or solenoid valves. Bernoulli’s theorem explains many phenomena, such as the lifting of a plane’s wing or of a light disc in front of a tube end from which air flows out quickly. This apparently paradoxical phenomenon is exploited for manufacturing vacuum gripping systems (vacuum cups) and handling, with no contact, fragile objects, such as semiconductor plates, silica discs, solar cells, precious metal foils, films and whatever needs to be handled with the greatest care. Our cups based on Bernoulli’s principle are made with anodised aluminium, with stainless steel centre thrust disc. 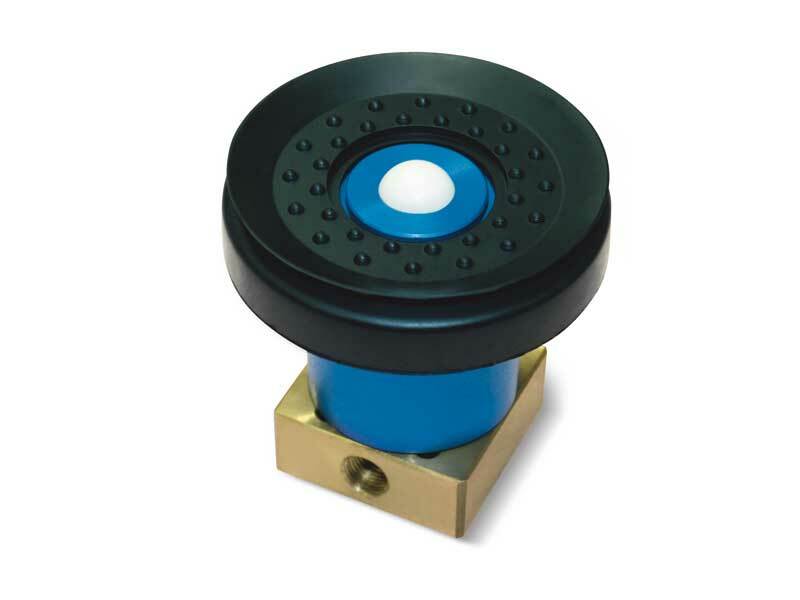 The antistatic silicon spacers, located on the cup gripping plane, prevent transverse movements of the gripped object. 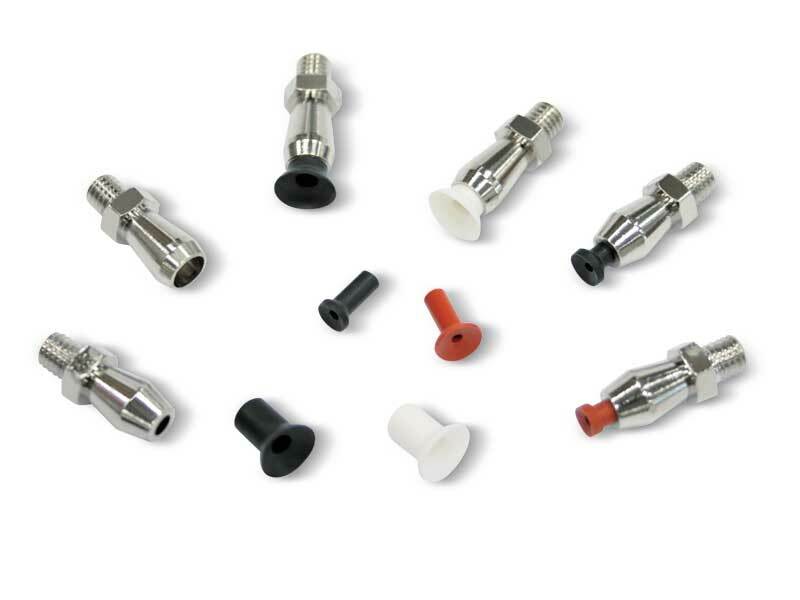 The compressed air supply connections can be axial and radial and the quick coupler for the flexible pipe is included in the package. The unused holes are closed with brass threaded caps. On the rear part of the cup there are 3 or 4 threaded holes for fiving it to the machine.